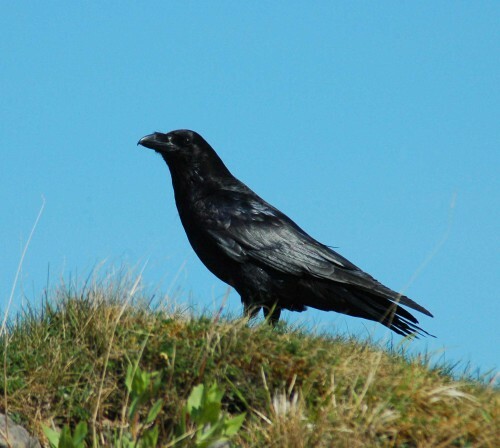 Ravens once scavenged on the streets of London and other British towns and cities, but were gradually pushed further and further away to the west and north of the country, until the majority of those remaining were residing in the mountains of Scotland and Wales. 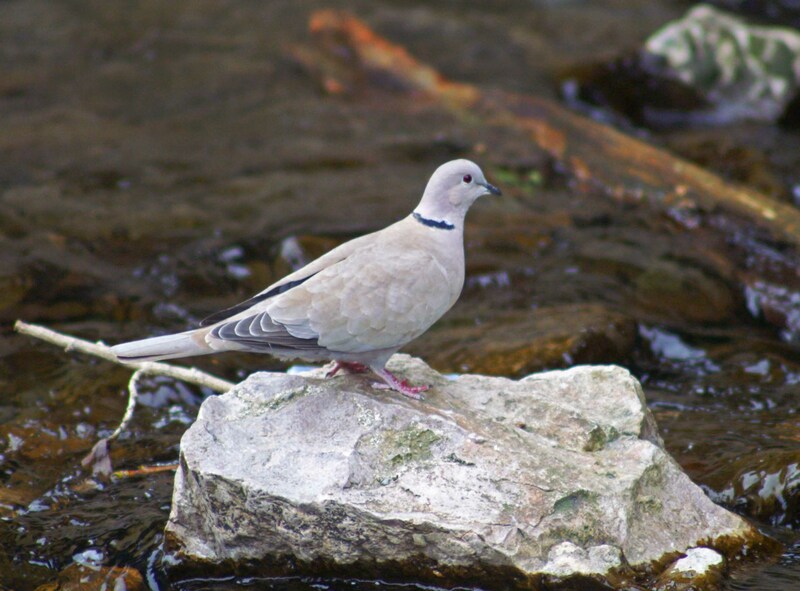 At one time, due to persecution, their numbers were reduced to around 1,000 pairs and they became birds much associated with upland wild places. 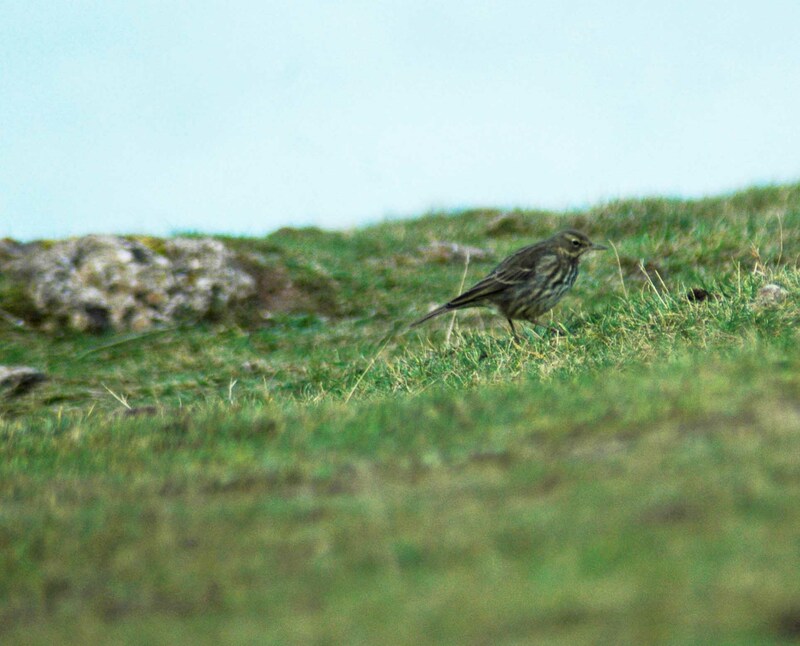 However, the ravens fortunes have turned and over the last twenty years their numbers have increased dramatically and they have repopulated much of Britain, including some urban areas. 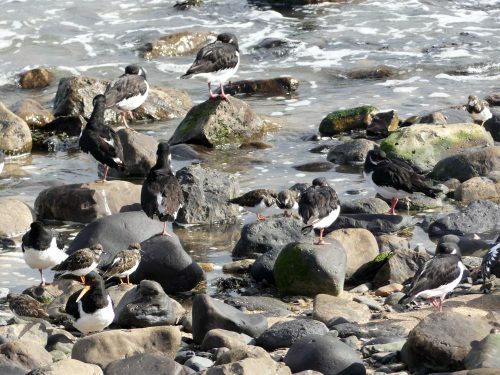 There are now over 12,000 breeding pairs. 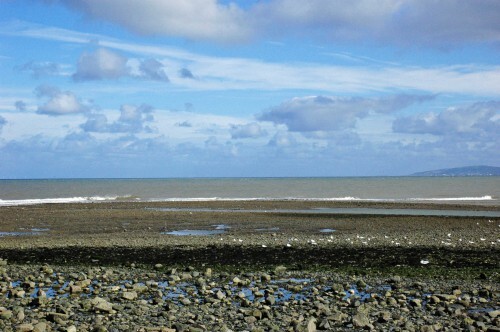 Newborough forest on the Isle of Anglesey is famed for its huge raven roost, where up to 2,000 birds have been recorded, making it the second largest raven roost in the world. 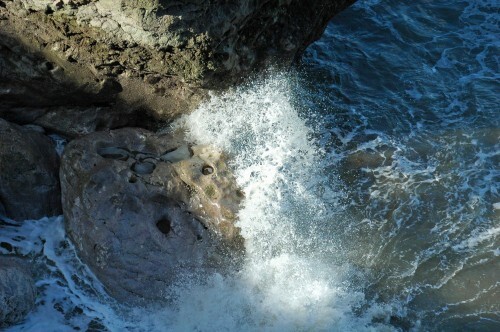 Ravens are also found around the Welsh coast, where they nest on sea cliffs. 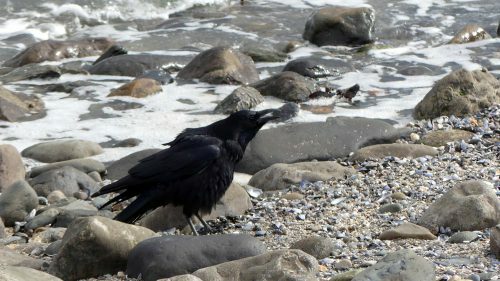 In my local area of North Wales we are lucky in having a resident breeding pair on the Little Orme and for me, a visit there is not complete without seeing what these charismatic corvids are up to. 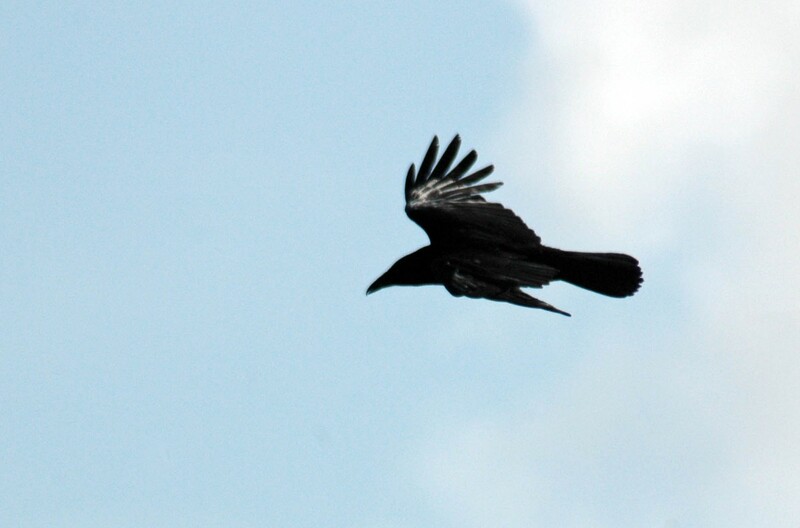 The raven is Britain’s largest corvid (crow). 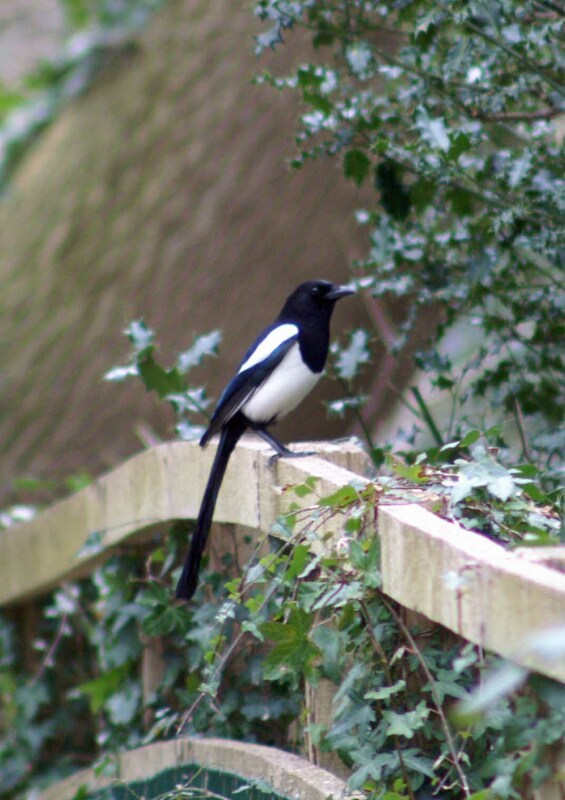 Plumage is black and highly glossy in appearance, with bright sunlight bringing forth purple and green highlights; the tail is wedge-shaped. 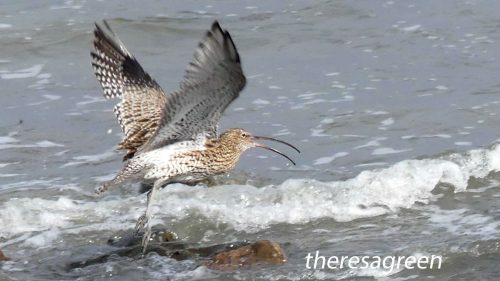 The bill is massive; adapted to pull apart raw flesh it’s an essential tool for a bird which scavenges on dead animals. Their call is distinctive, a deep croaking sound, known as ‘gronking’ which often alerts me to look up to watch one flying overhead and that is surely one of the most evocative sounds of Britain’s uplands. 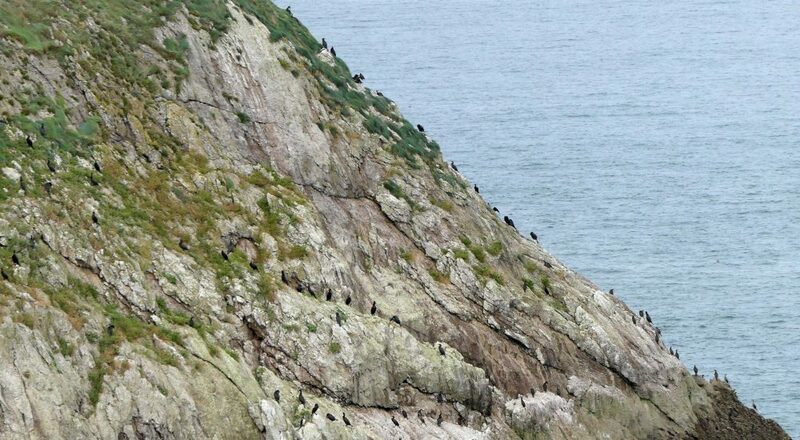 The Little Orme’s resident ravens are the avian monarchs of this cliff. 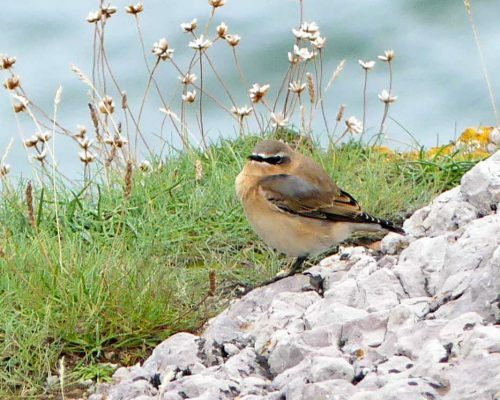 They are often seen sitting together on the cliff edge from where they survey their realm, gleaming regally in the sunshine, occasionally lifting their heads to gronk at passing birds or at the empty sky. 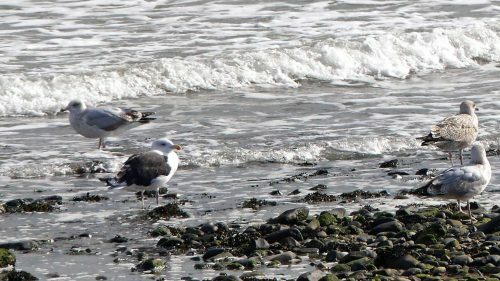 They have no need to defend their territory as the mere physical presence of these powerful birds is enough to establish their claim to it. But as with other species of birds, when nesting they may become more defensive and will attack anything they perceive to be a threat. 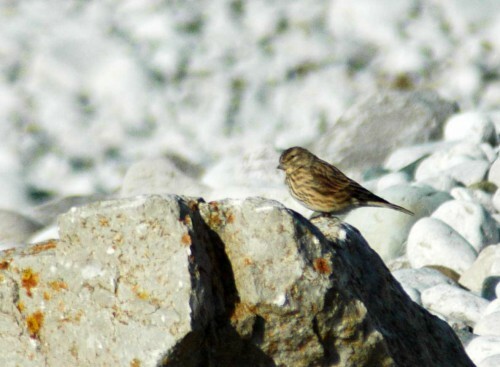 When they are not ensconced there, another favoured spot for perching is further up towards the summit atop a rocky ridge. 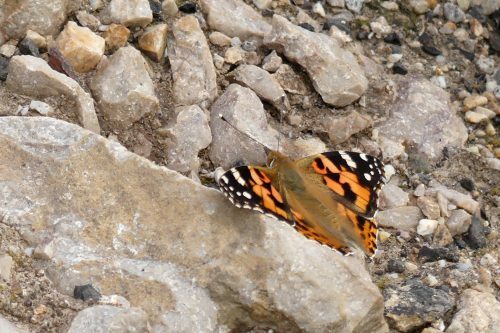 They can sometimes be found flying along the cliffs and across the summit. 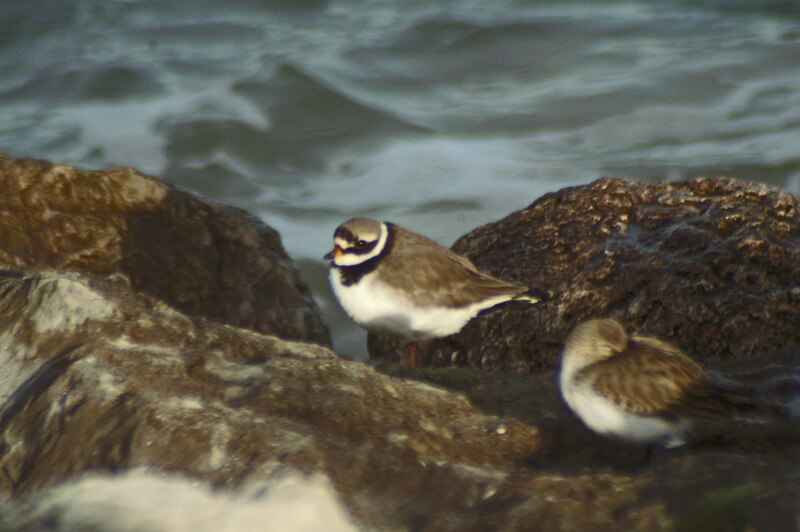 The male of the pair may also be found at the sea edge of the cliffs where he spends long minutes hunched on a ledge gazing out to sea watching for potential invaders. 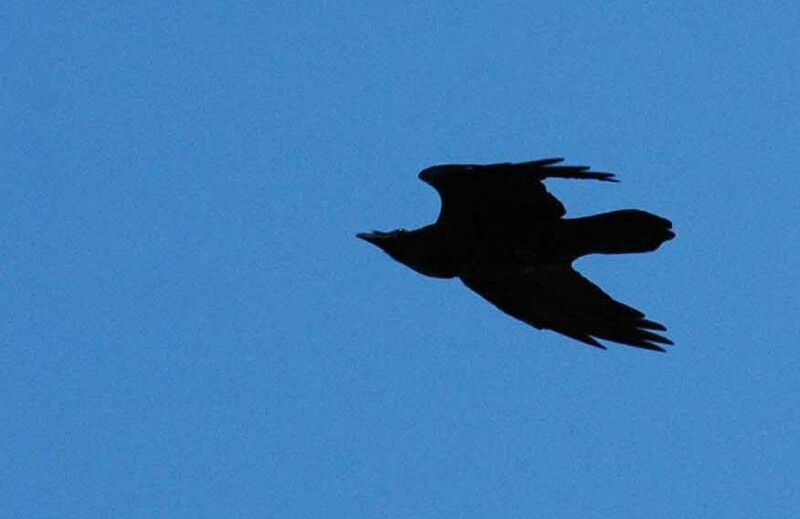 The everyday flight of the raven is direct, strong and steady, but it can also glide and soar freely and put on an impressive aerobatic display. 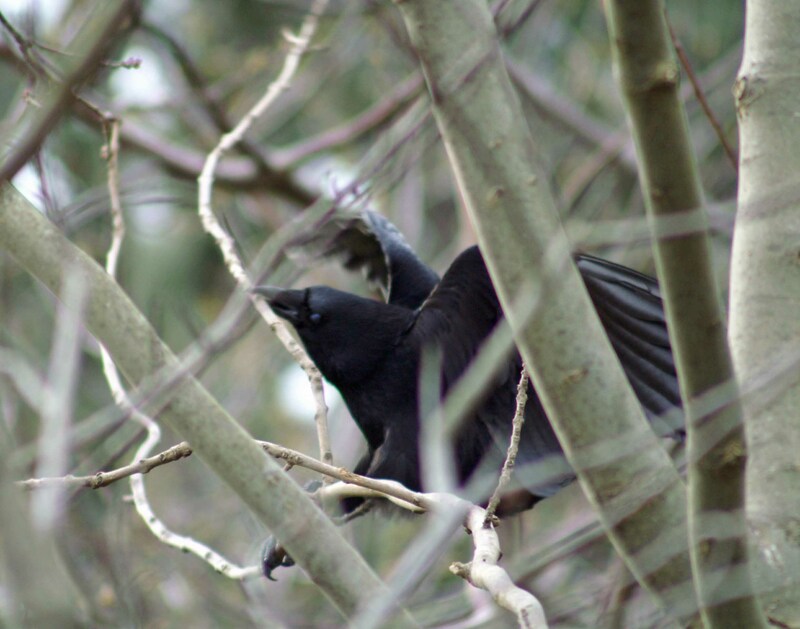 In spring particularly, pairs of ravens tumble together high in the air, wings half-closed, rolling over sideways and nose-diving. 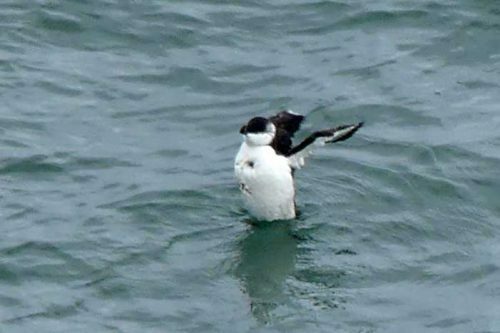 They also have the trick of flying upside down for short distances. Perhaps these aerobics are part of the raven’s courtship display, but they may also perform for the joy of it and just because they can. 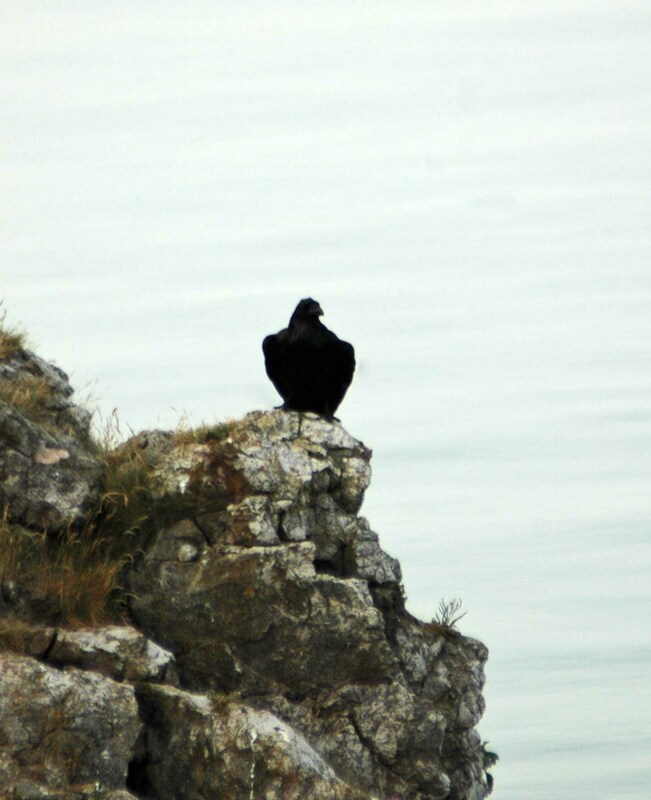 Ravens are sometimes regarded as the vultures of sheep country as they patrol in a pair or as a family group, searching for carrion or an ailing sheep or deer which they will watch and wait to die. 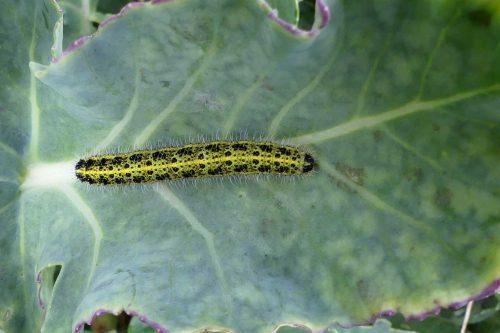 They will eat almost anything, mainly carrion and small animals, but also insects, shellfish and even grain and acorns. 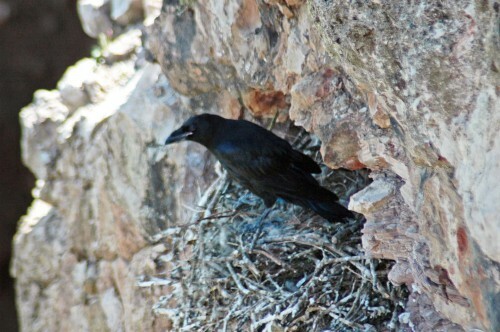 The Little Orme’s ravens return to the same nest each year, adding new material to renovate it as they need to. 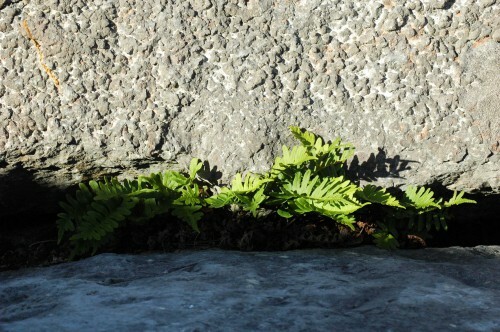 In the years I have watched them, they have raised only one or two young each year. 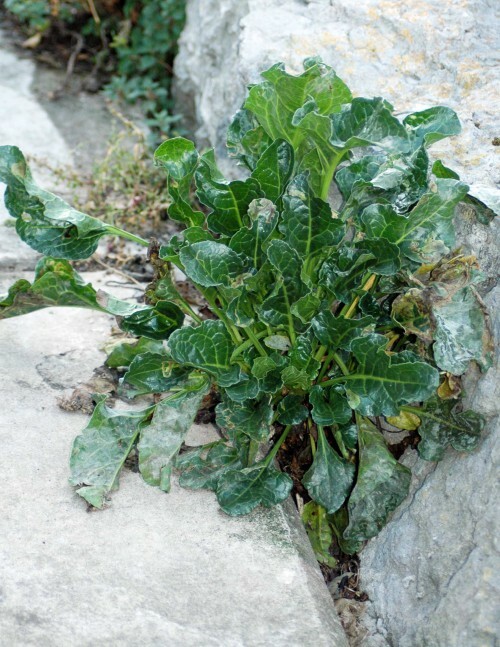 Both sexes build a nest of sticks cemented together with mud and bound and lined with moss and sheep’s wool or whatever is available locally, it is shaped into a deep cup, preferably on a ledge or in a crevice. 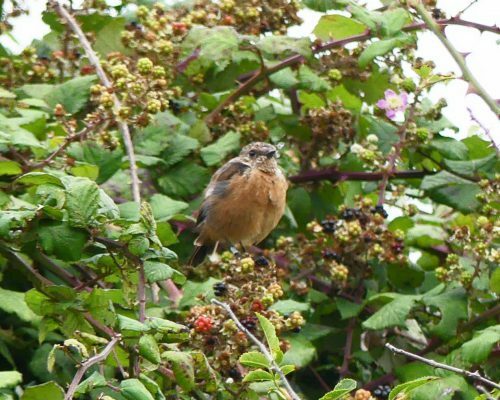 They are amongst the earliest of birds to produce eggs, between February & April. 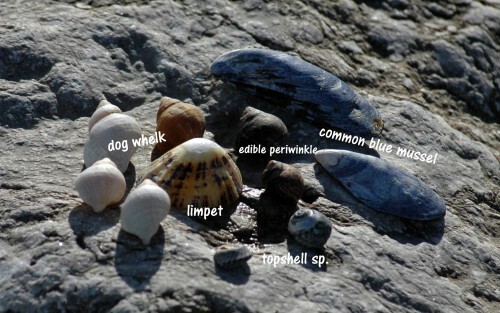 There may be 4-6 eggs, pale green or blue with dark markings. Incubation, by the female only, takes about 19 days. 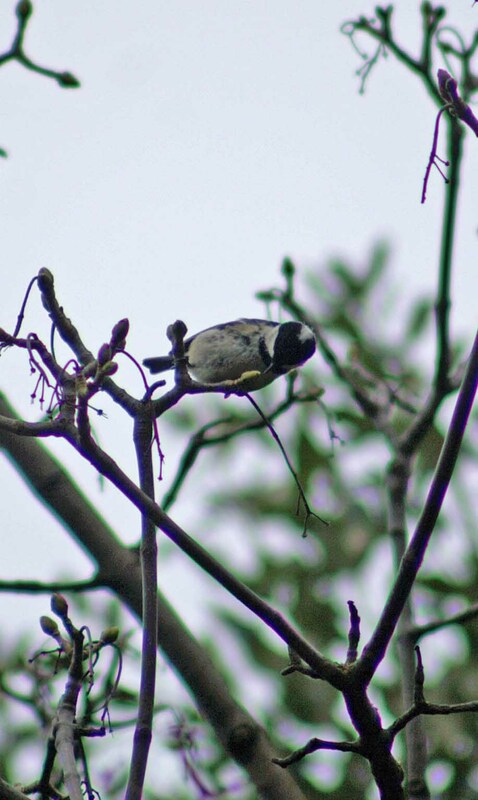 Nestlings are fed by both parents until they leave at about 6 weeks. The raven is probably one of the world’s most intelligent and playful bird. Modern experiments have shown that they can count up to 8. 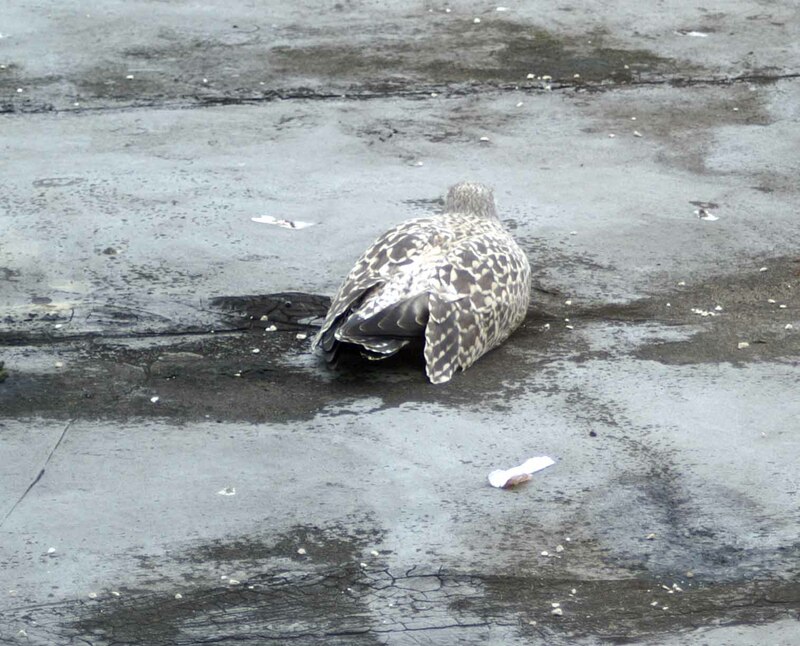 Our hunter-gatherer ancestors would have observed the keen intelligence of this bird. 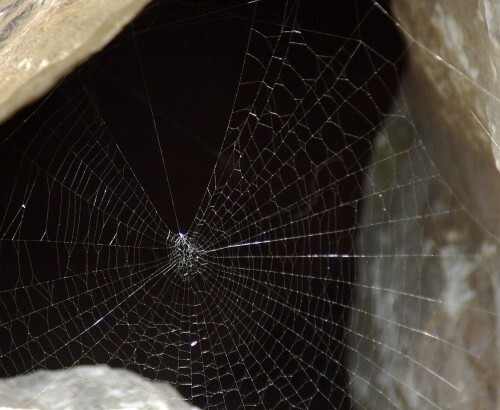 It has a well-documented habit of deliberately revealing the whereabouts of deer, so that hunting wolves can find their quarry and leave spoils, which the ravens could eat. Even modern deer-stalkers have reported ravens helping them to locate deer, as the birds know that they will receive the ‘gralloch’ or guts after the deer is killed. 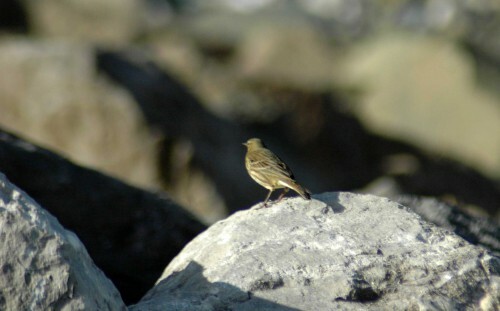 Paradoxically it has also been regarded as a bird of ill-omen. The old collective noun for a group of ravens is an ‘unkindness’, perhaps because of its harsh call and its presence as a scavenger at scenes of death. In the Old Testament of the Bible, the raven was the first bird Noah sent to look for land, and Elijah is described as being provided for by ravens. 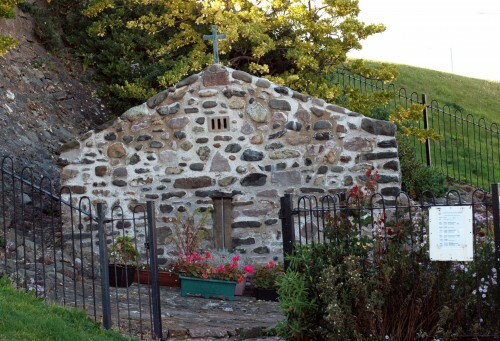 They are used as a symbol of God’s providence in both the New Testament and in Christian art. 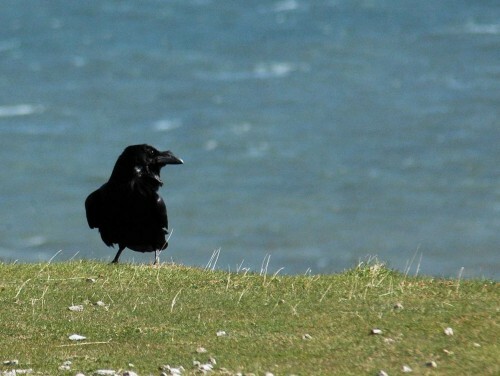 There is probably more folklore concerning the raven than any other bird in Britain. 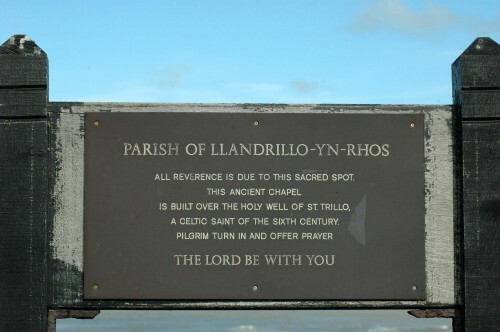 In Welsh folklore, Bran the Blessed, the brother of Branwen (Bran is Welsh for raven) is a deity and a guardian of Britain whose totem is a raven. According to the Mabinogion, Bran ordered for his own head to be cut off, after which it could still speak words of prophecy. 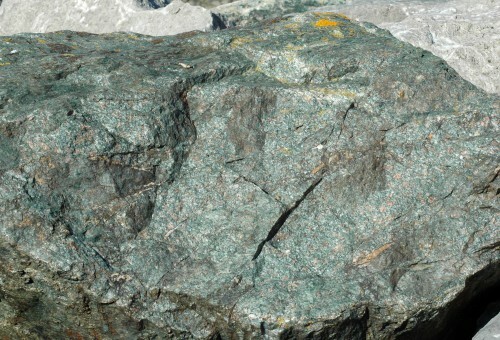 Eventually it was said to have been buried beneath Tower Hill, at the Tower of London as a talisman against invasion. The presence of ravens at the Tower is an echo of this legend and the prophecy says that if the ravens ever leave the tower, the Kingdom of England will fall, hence their wings are clipped as a precaution. 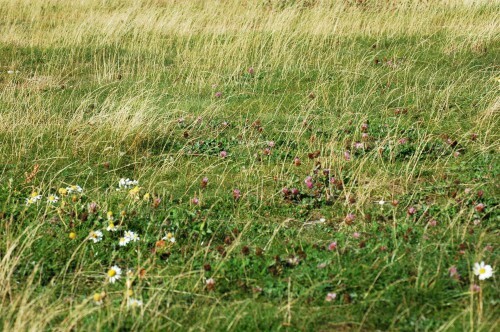 It is thought that there have been at least six ravens in residence at the tower for centuries. Charles II reputedly ordered their removal following complaints from John Flamsteed, the Royal Astronomer. However, they were not removed as Charles was then told of the legend. Charles, following the time of the English Civil War, superstition or not, was not prepared to take the chance, and instead had the observatory moved to Greenwich. Odin, the chief of the Norse gods, was accompanied by a pair of ravens, Hugin (thought) and Munin (memory), who would fly far and wide to bring news to Odin. One of Odin’s names, Hrafnagud, means the ‘Raven God’. 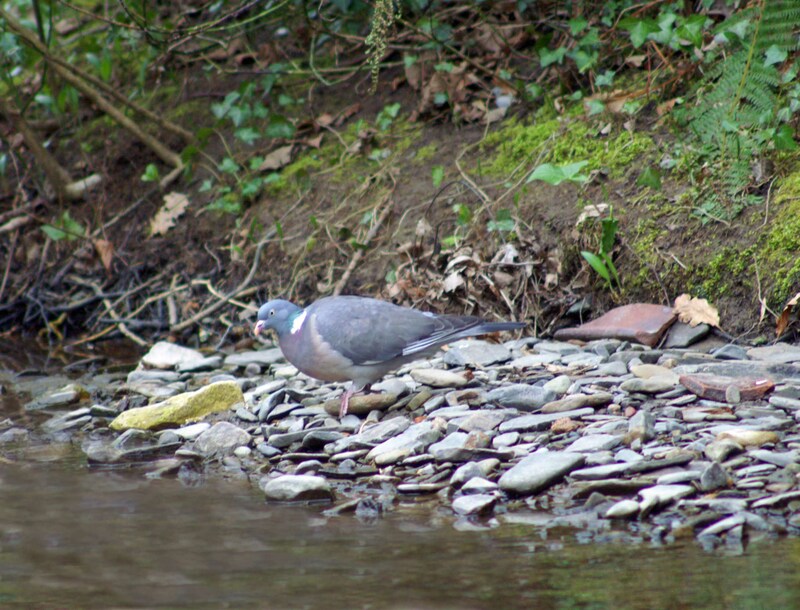 This post was inspired by a walk taken last weekend with some lovely people I met for the first time then: Gill who is the chairperson of the Bryn Euryn Users’ Association and her partner Tony who is a ‘proper’ birdwatcher. 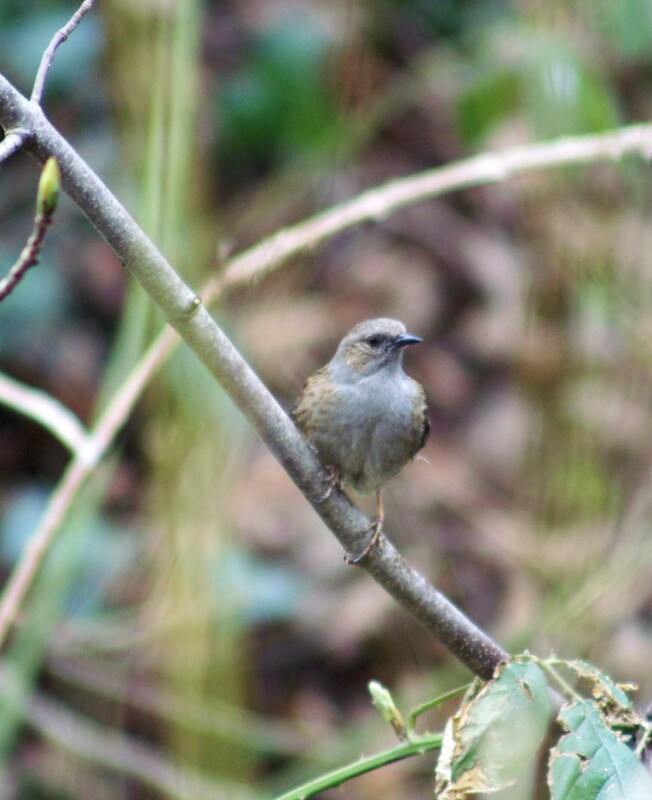 As well as enjoying their company I also learnt a lot from them both; from Gill it was how the Bryn had evolved into a Local Nature Reserve and some of how its habitats are maintained, which I’m hoping to discover more about in the near future. 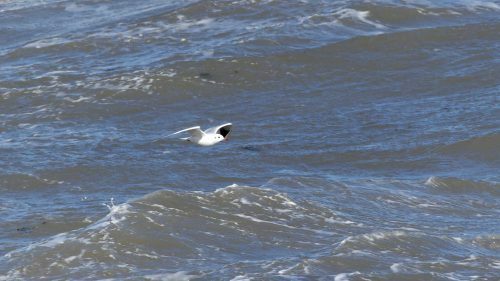 Tony reminded me how much I’ve been missing here and I rediscovered that when it comes to spotting birds, particularly when they are faraway dots on a wavy sea, three pairs of eyes are better than one and that a telescope widens the horizons in more ways than one! 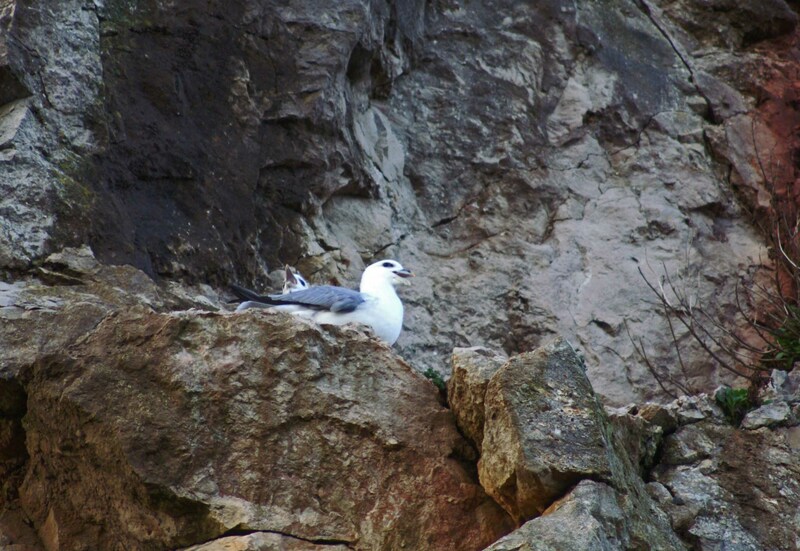 Firstly though, we had some good sightings of Fulmar which are back at their nest sites on the cliff face. The Raven was up in his favourite spot just above them and Tony showed me their nest site where we saw and heard them both a little later on. 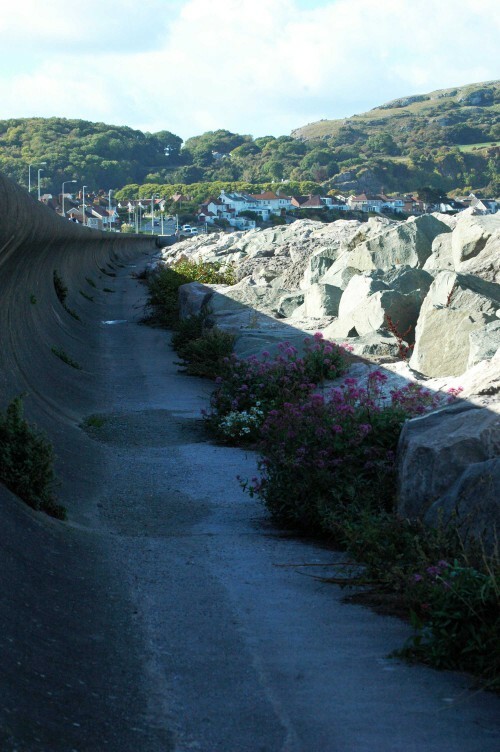 We also spent a few minutes hunting for signs of a Black Redstart that was reported being seen here a few weeks ago, but no luck. 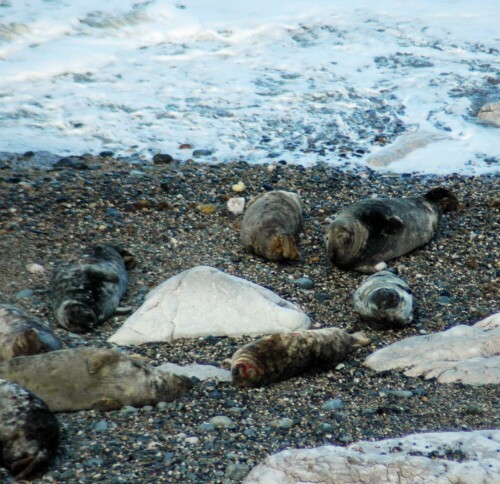 From the clifftop overlooking Angel Bay there were two Grey Seals swimming and further out to sea there were some great seabirds including numbers of Great Crested Grebe, Red-throated Diver , Guillemot & Razorbill as well as the more easily seen Shags & Cormorants. 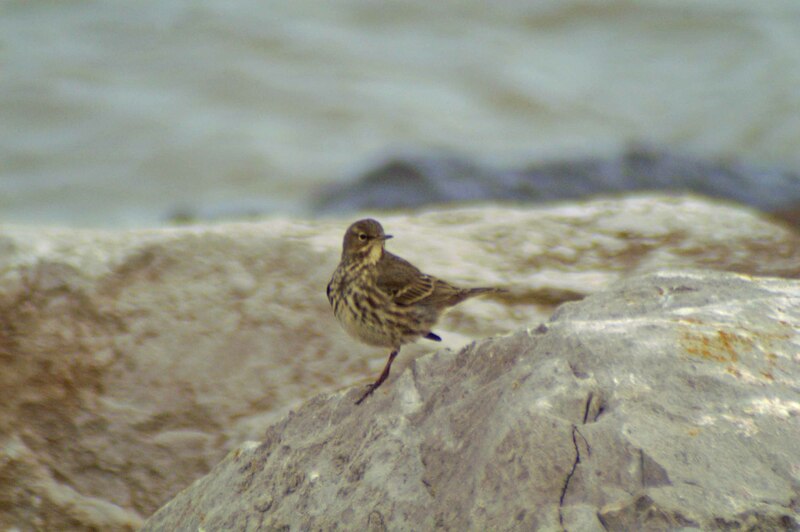 Walking around the rocky outcrop to the ledge that overlooks Penrhyn Bay and the wider sea, we encountered a Rock Pipit pecking around the grass and rocks, not at all concerned that we were there and presenting an irresistible photo opportunity. 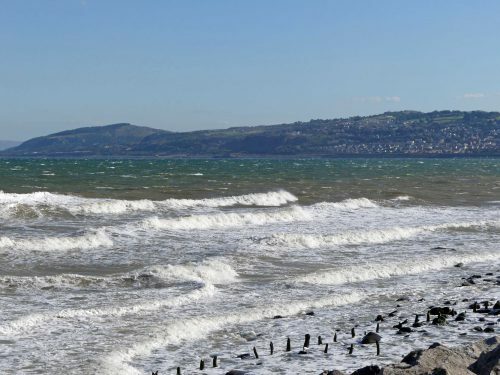 This week I waited for a break in the weather to return to the Little Orme for more viewing and Friday’s sunshine was just what I’d been waiting for. 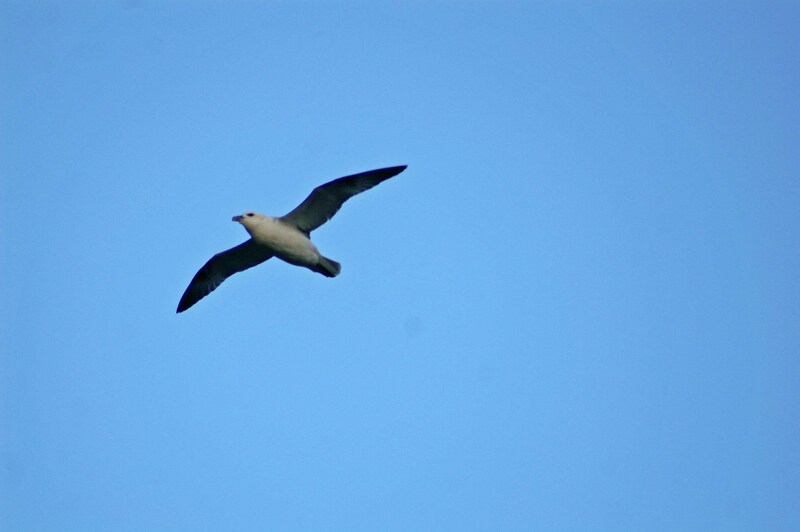 I was particularly keen to see more of the Fulmar so headed in their direction first. 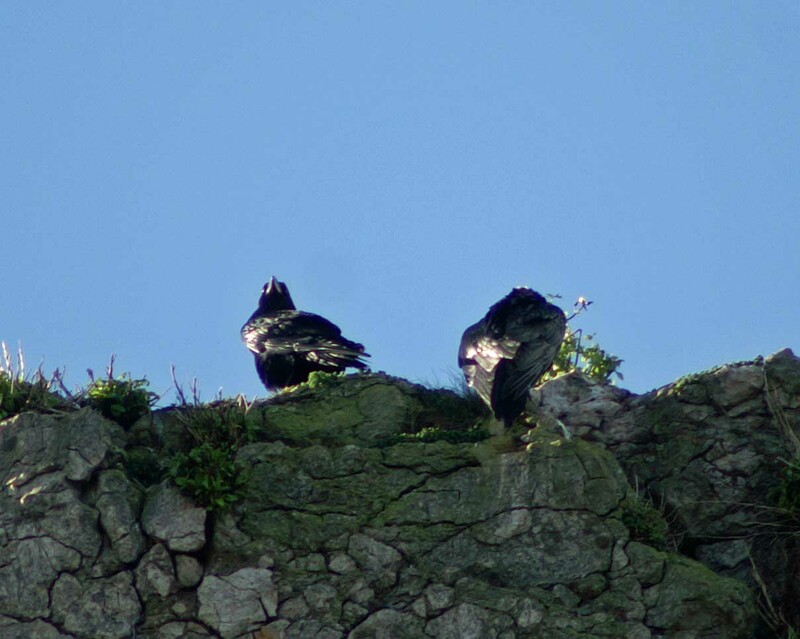 The Raven pair were once more sitting up in their favourite spot above the Fulmar site. 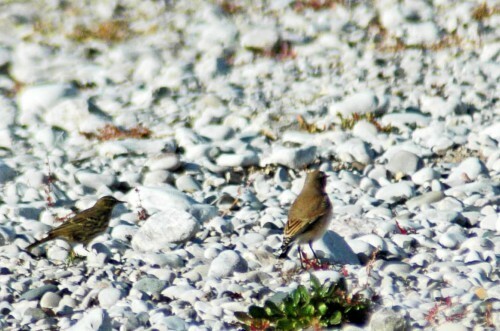 They are both looking gorgeously fit and healthy, their plumage shining brightly in the sunlight. 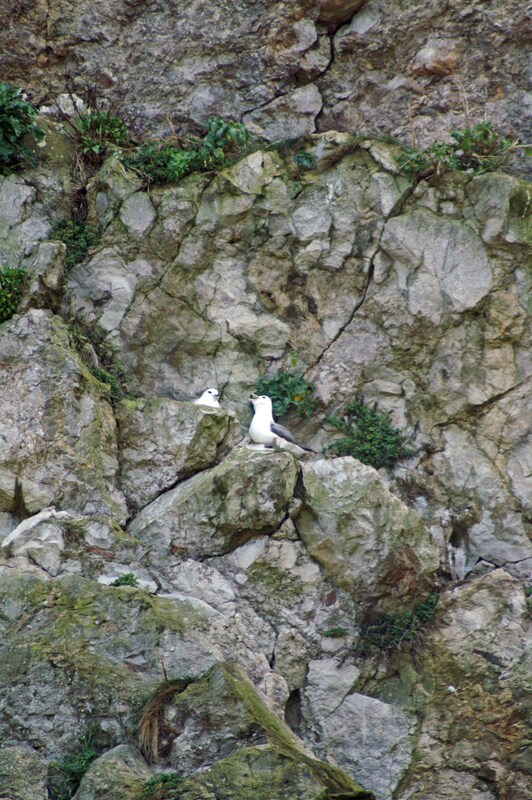 I counted three pairs of Fulmar here initially, who were later joined by what I think was a single male on a site just around the rock. 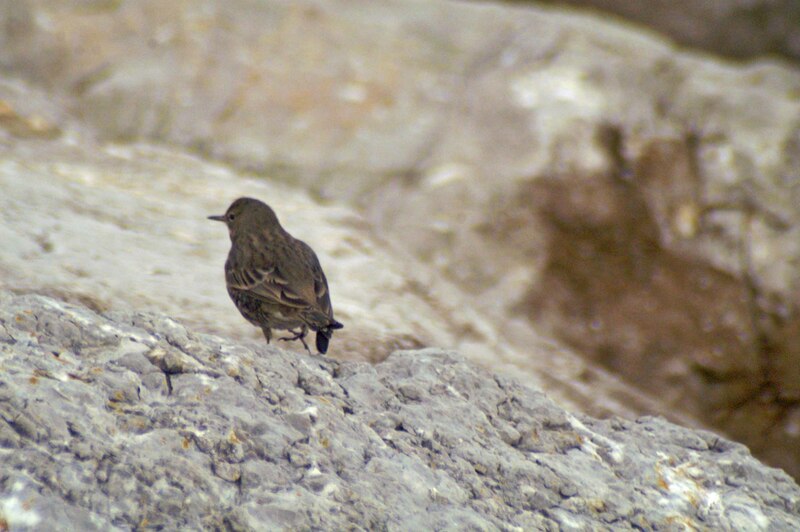 Some birds were easier to see than others as they have chosen their nests sites carefully to give them some shelter from the elements, and those I’m assuming to be the females were mostly tucked behind a rock or back into clefts in the rock-face. 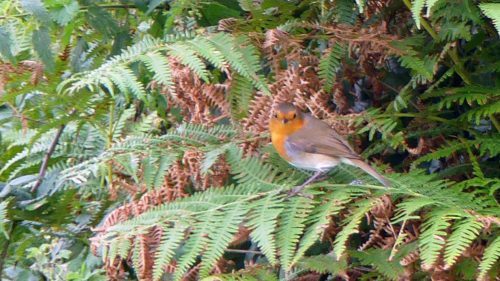 The birds were noisy; males are definitely proclaiming their territories and there was quite a bit of aerial activity, taking off, swooping around and then landing again with more vocals. 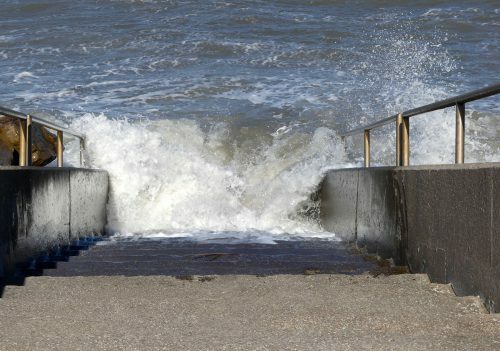 The sound has been described as harsh, throaty and machine-gun like. 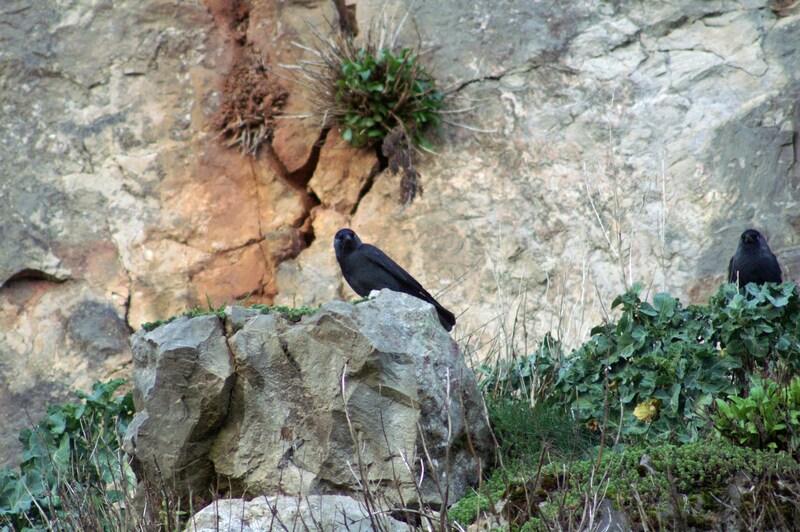 There were a lot of Jackdaw on the cliffs too and I suspect that much of the Fulmar’s vocalising was aimed at them and they in turn were giving back as good as they got, so it got very noisy at times. 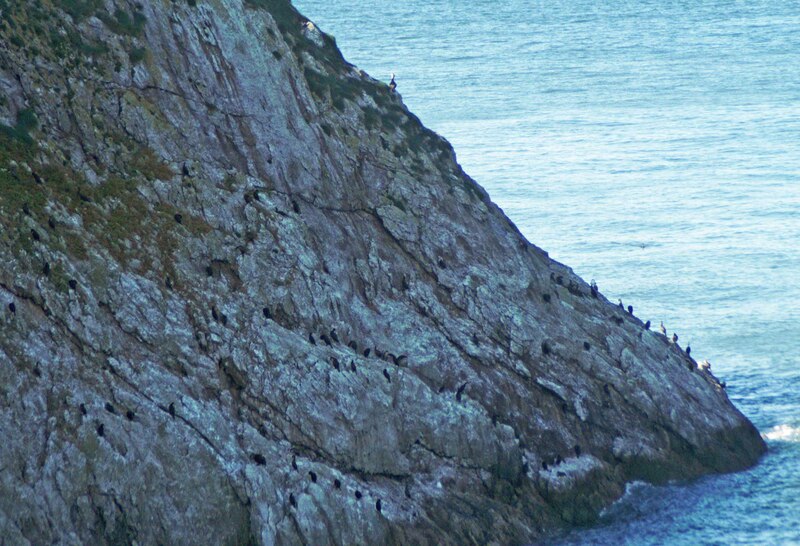 There were more of the birds on the cliff-face at the edge of Angel Bay; they were making even more noise, much of it directed at a single bird that was flying around and attempting to land in spots already occupied by pairs of birds. 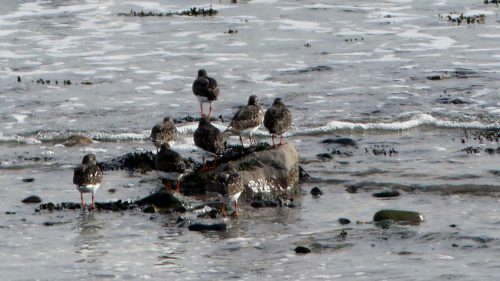 I think there may be 8 pairs in total, which will be easier to establish once they’ve settled down. 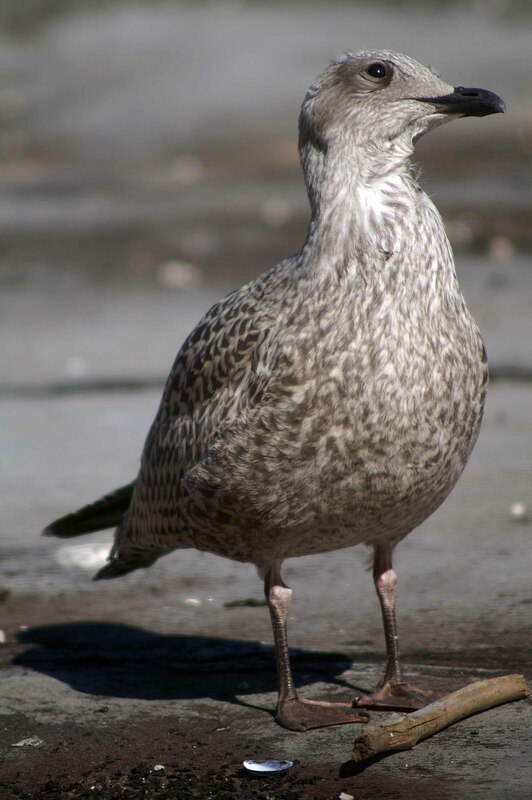 The common name is derived from the Old Norse word ‘full’ meaning foul and ‘mar’ meaning seabird or gull. 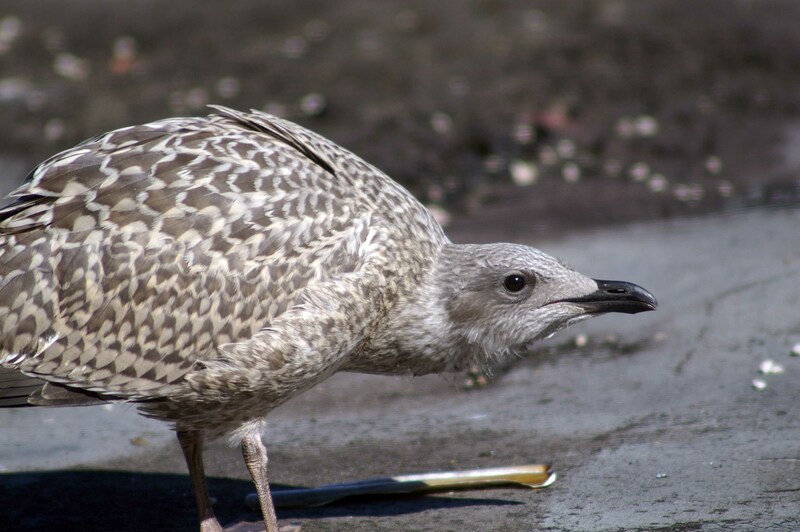 The foul part refers to the fact that they can spit out a foul-smelling oily fluid to defend their territories from intruders; it’s not all bad though, the oil is also an energy rich food source for chicks and for the adults during their long flights. 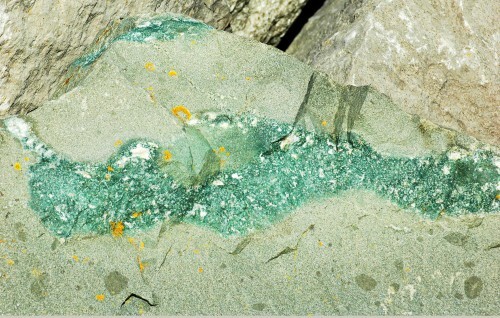 The glacialis of the scientific name means icy. 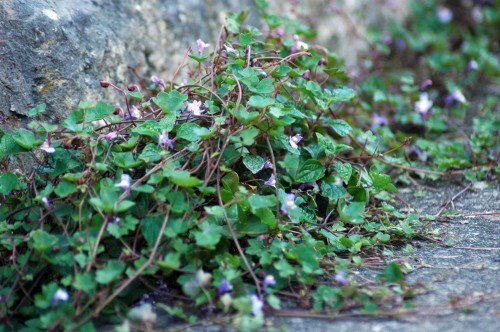 They are long-lived, with a lifespan of 40 years not uncommon. 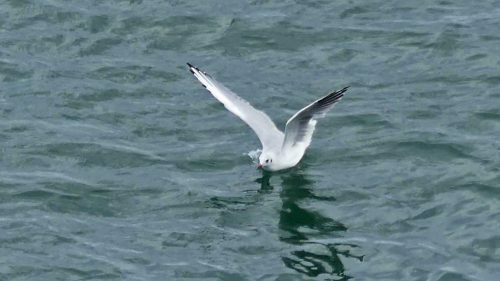 The Fulmar is a bird of the open sea, a ‘tube-nose’ that is a first cousin of the albatross and belonging to the same group of birds as the shearwaters and petrels. 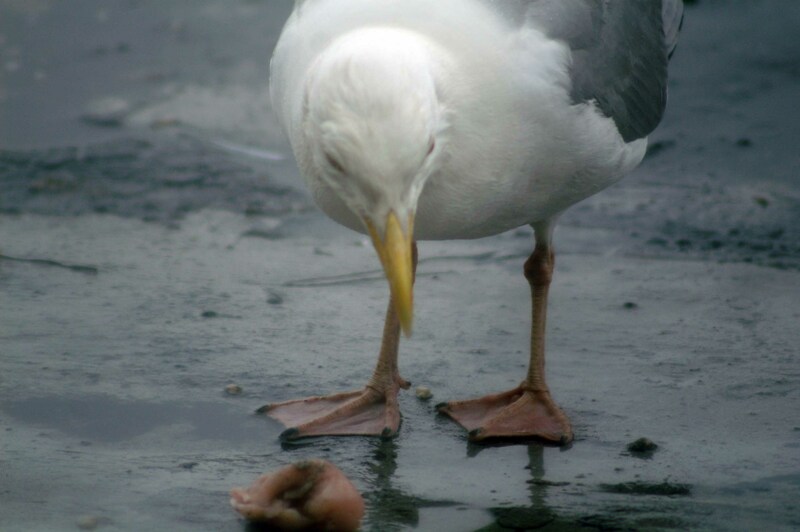 They feed at sea on crustaceans, squid, fish, offal and carrion mostly from the surface.To deal with excesses of salt they take in with their food they have a gland located above the nasal tube through which all the bird’s blood is pumped and the salt removed. 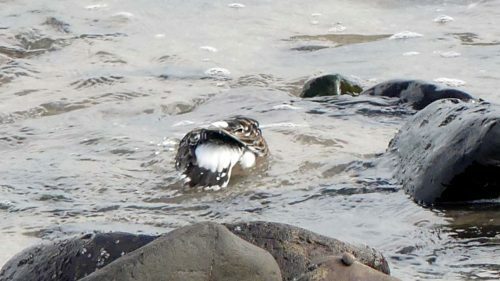 The salt-laden discharge runs from the tube nose along a groove in the beak and drips off away from the body, keeping plumage clean. 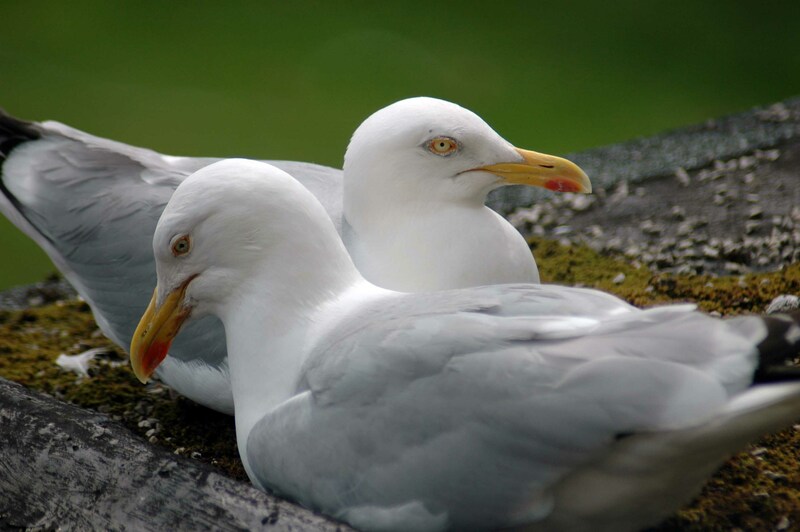 At first sight Fulmars resemble gulls but seen more closely are distinguished by the shape of their beak which has a tube-shaped proturberance on the top and a thicker neck. 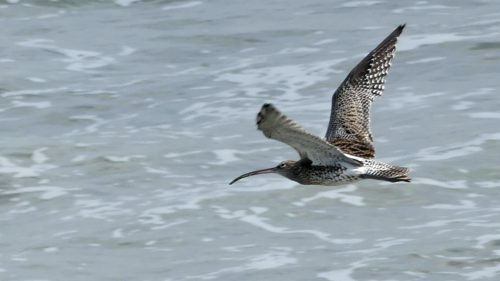 They have long, narrow wings and fly low over the sea on stiff wings, with shallow wingbeats, gliding and banking to show its white underparts then grey upperparts. 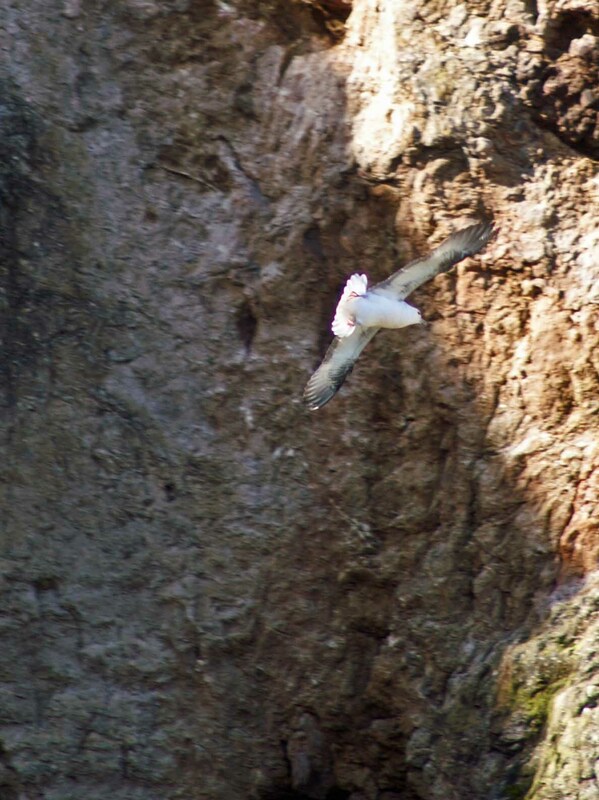 At its breeding sites it will fly high up the cliff face, riding the updraughts. 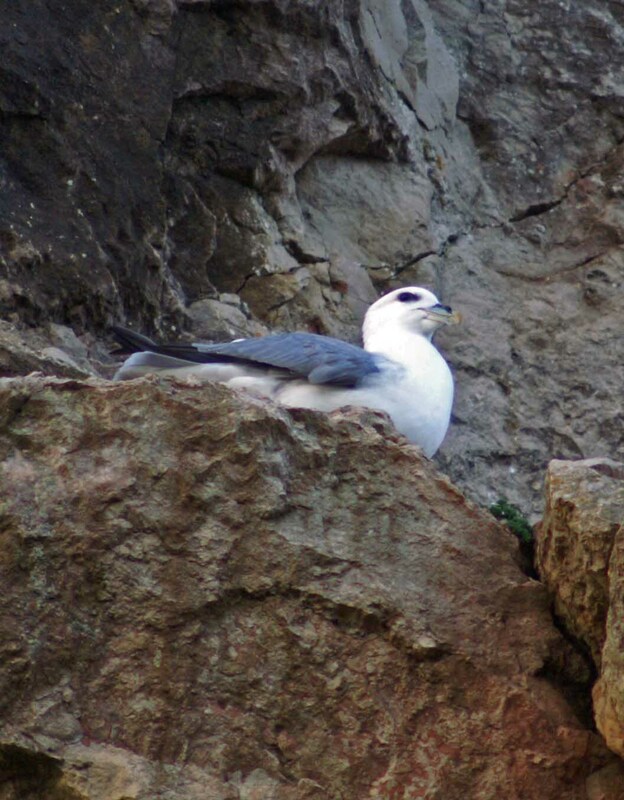 Nesting sites are deserted in September and Fulmars are usually absent offshore during October and November. 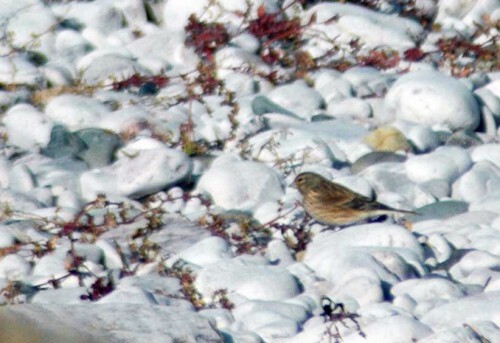 Their absence from the breeding cliffs is short-lived as by late November or early December the birds are back prospecting around the nesting sites. 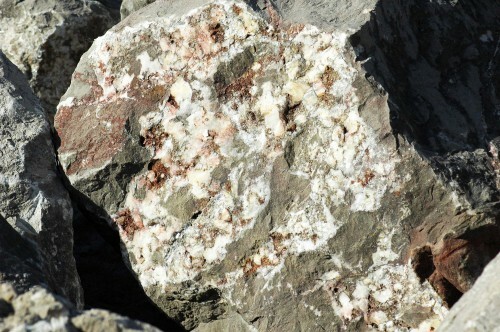 The nest itself may be nothing more elaborate than a depression in bare rock or a scrape in turf, although they are sometimes lined with a few pebbles. 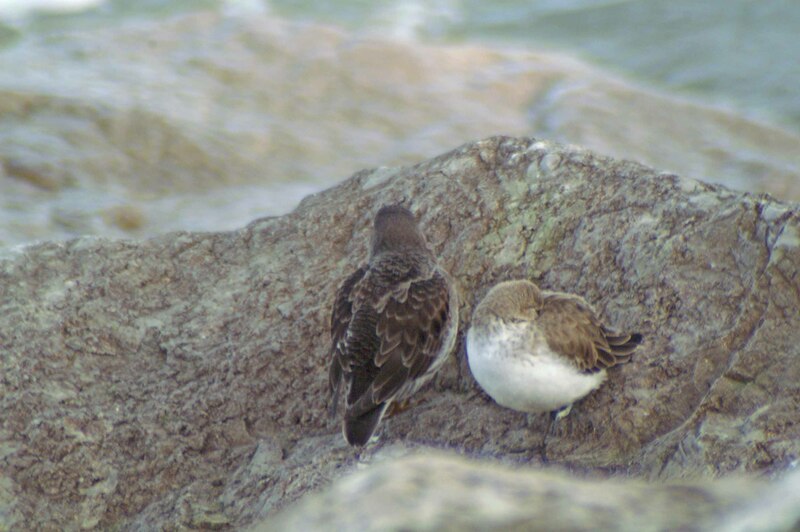 The female lays a single white egg in May, so they’ve a while to go yet. 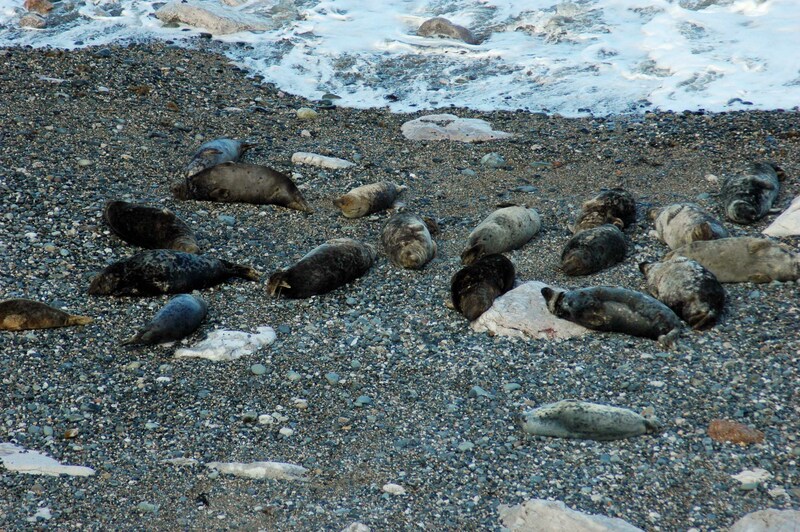 A quick glance down onto Angel Bay brought a pleasant surprise – a mixed size group of 22 Grey seals. 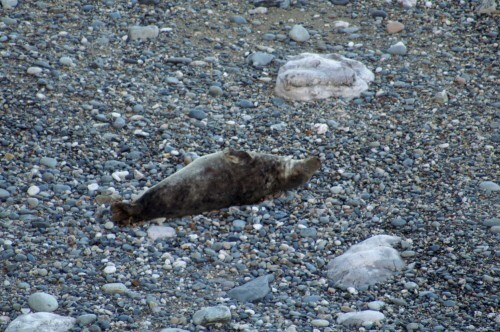 They were very chilled, many of them asleep on their backs; gorgeous. 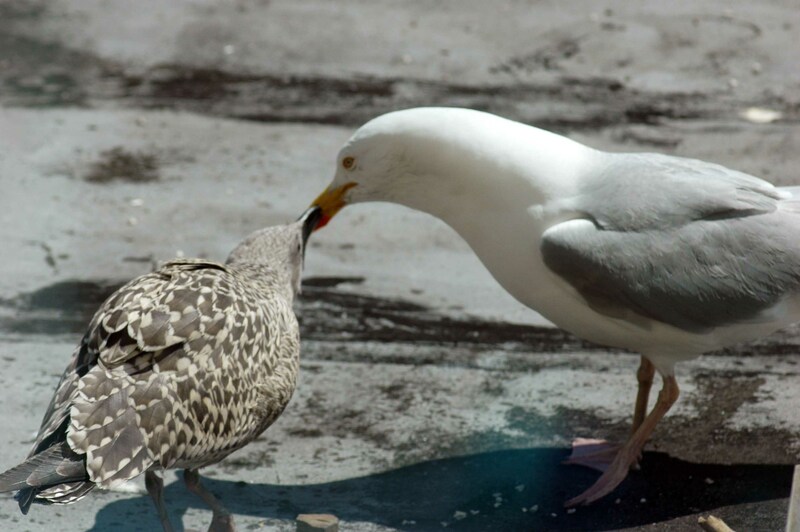 The sight and sound of Herring gulls are an integral part of the local community here and as I wrote last year, you either love them or you loathe them. 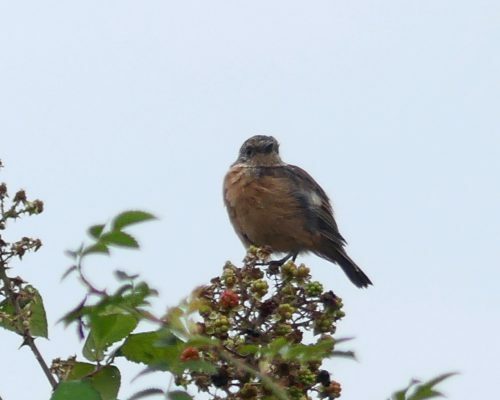 Personally I rather like them, but having just endured this year’s breeding season and had them as very close boarders, I may have gone off them slightly! The Edwardian building we occupy the centre part of played host to two nesting pairs this year, one pair on either side of us, each settling into the top of a tall terracotta chimney pot. 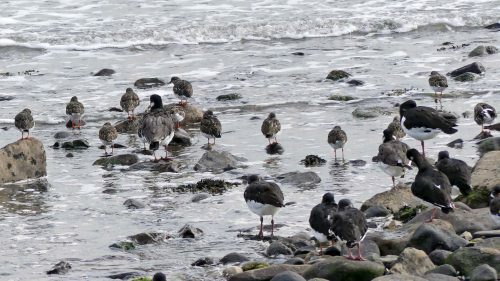 I can see the appeal for them, quiet neighbourhood, excellent panoramic penthouse views, just a minute’s flap from the sea, a wide variety of eating opportunities close by. .. 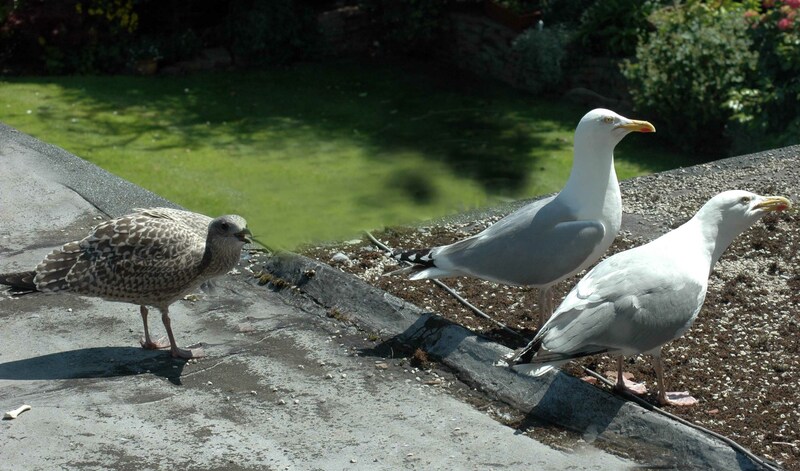 Unfortunately from a landlady’s viewpoint, they were not the ideal ‘guests’ and the noise levels were, frankly, unsociable. Stuck in the middle of the two nests sites we were subjected to frequent sessions of raucous territorial shrieking in stereo. Requests to pipe down a bit fell on deaf ears. 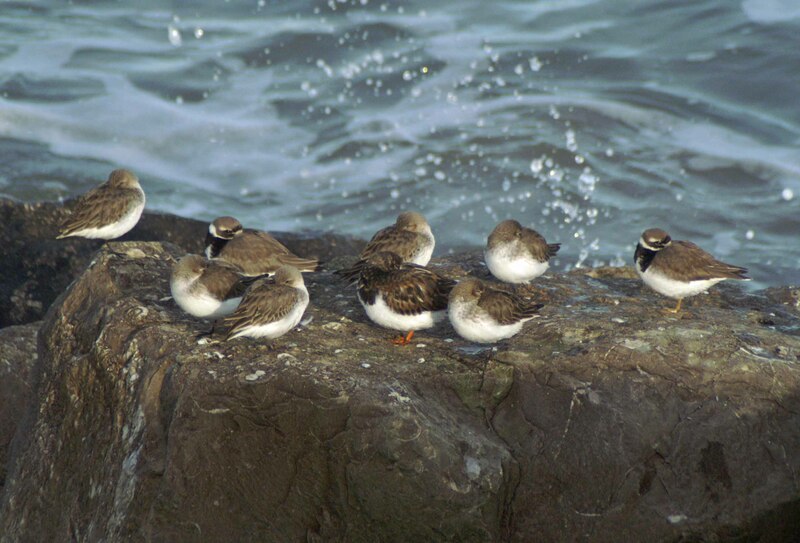 Once the offspring hatched the sessions became even more frequent, then reached their peak once the youngsters fledged. 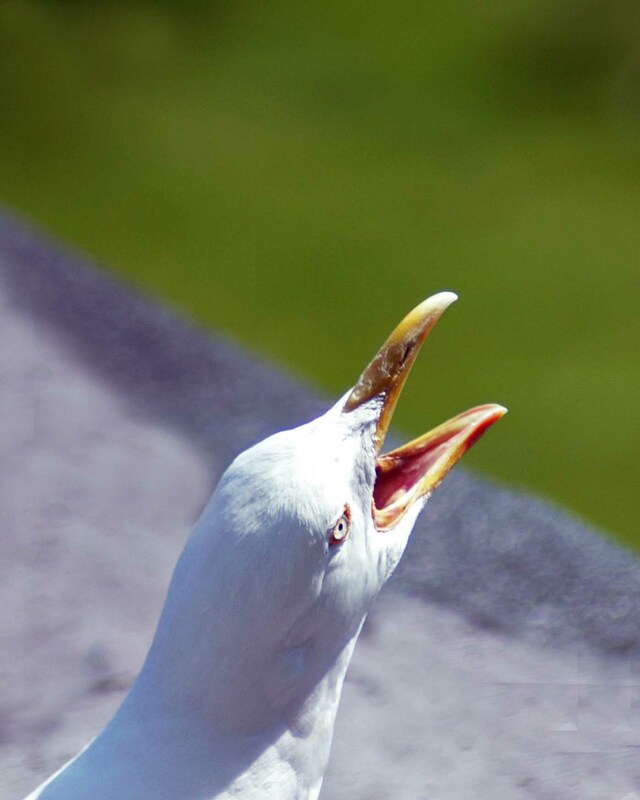 That was when they moved down onto our flat roof, which is just below my bedroom window, and really made their presence heard. 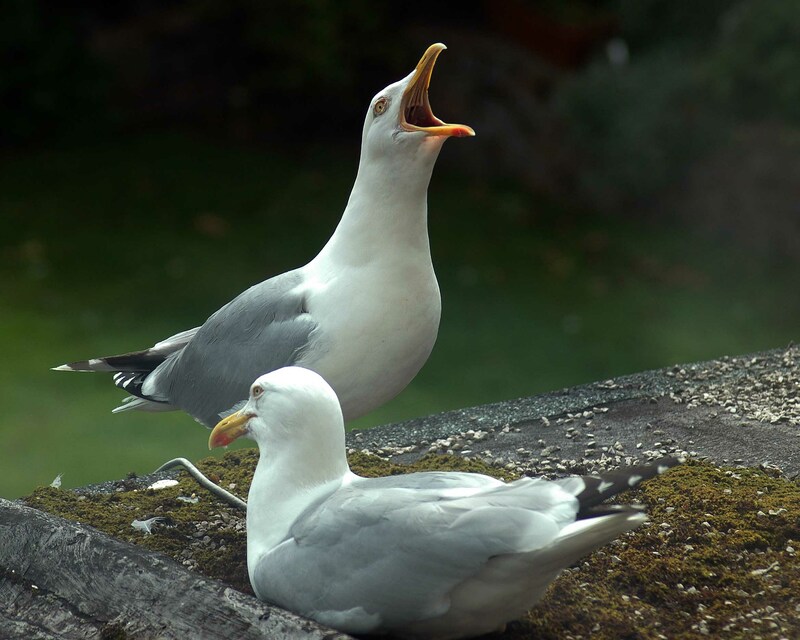 Herring gulls herald the crack of dawn very loudly, which at the time was around 4.30am, so that’s when I woke up too. 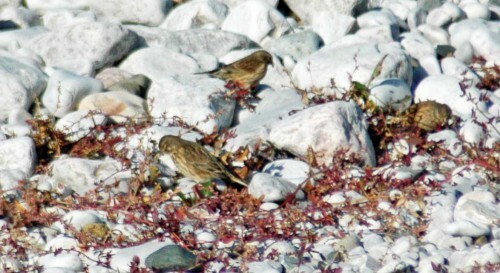 They are much louder than cockerels and even less tuneful. 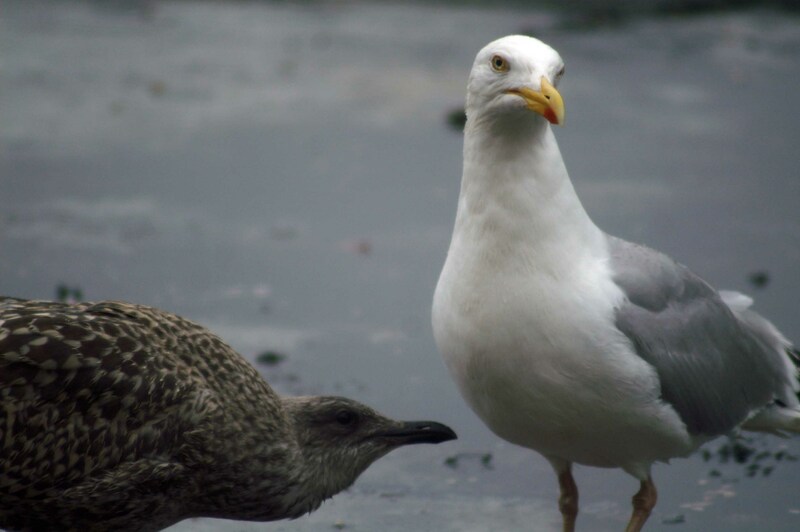 The proximity of the gulls definitely disturbed the usual peace of the neighbourhood, but on the positive side it also literally gave me a window into part of their daily lives. 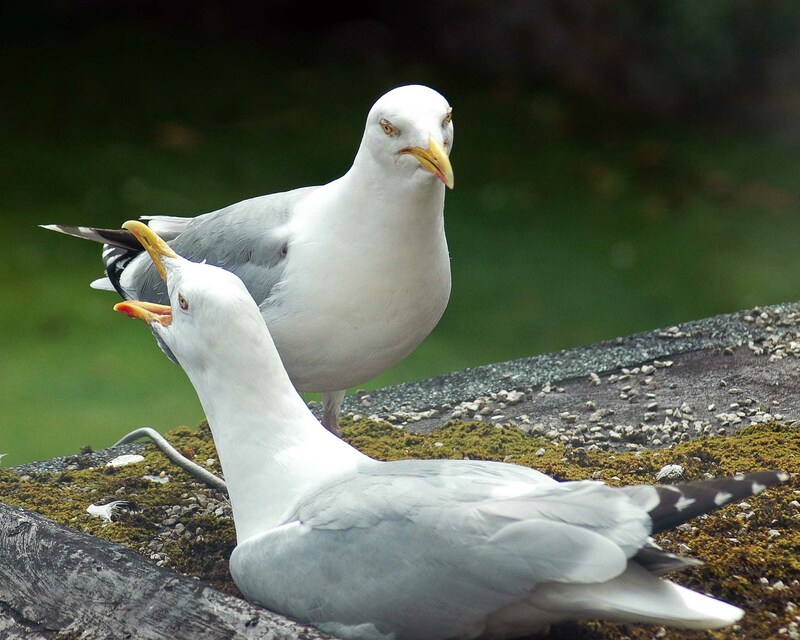 I soon realised that the bouts of loud calling are not a random act, the birds use their powerful voices to call to their partners and offspring as well as to declare their possession of a territory and to warn off intruders. 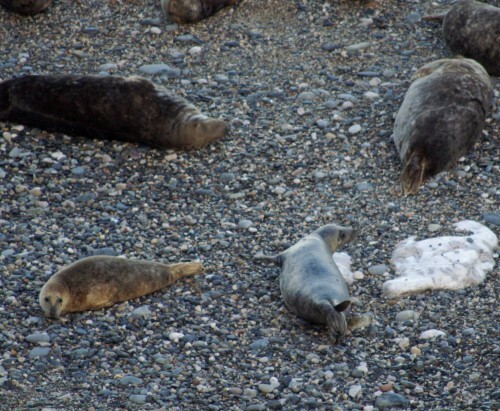 As the youngsters grow in confidence and flying ability improves they leave their ‘home’ area to explore, but parents still return there with food and summon them back to eat it. 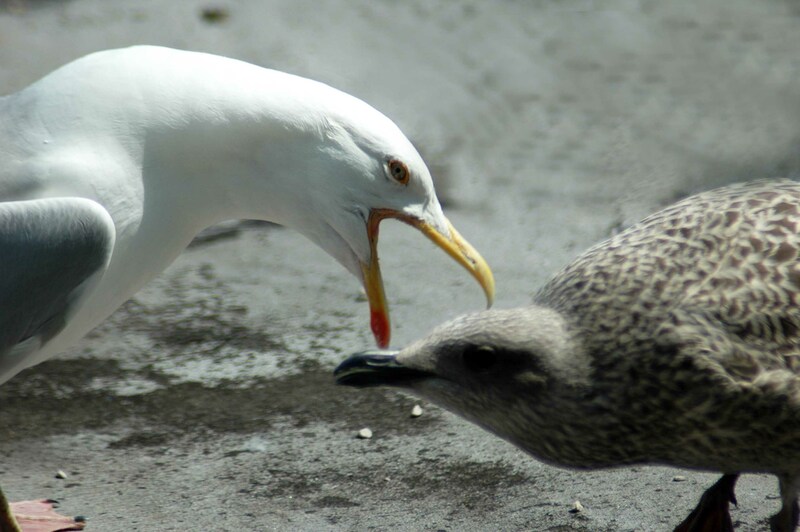 The adults always called loudly before delivering food to their young, perhaps it stimulates regurgitation? 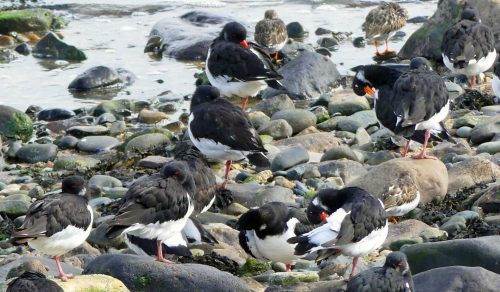 The adults had a ritual; each time they arrived back with food they began calling loudly, starting off with their heads lowered, then raising them, cranking up the volume until they reached a crescendo with head thrown back and beak opened fully. 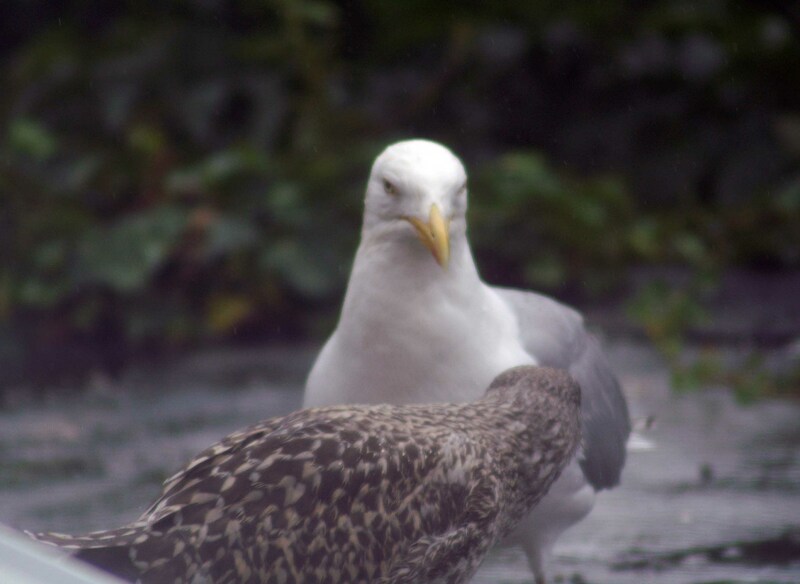 They are vigilant and attentive parents and deal patiently with harassment by their young ones that persistently beg for food. 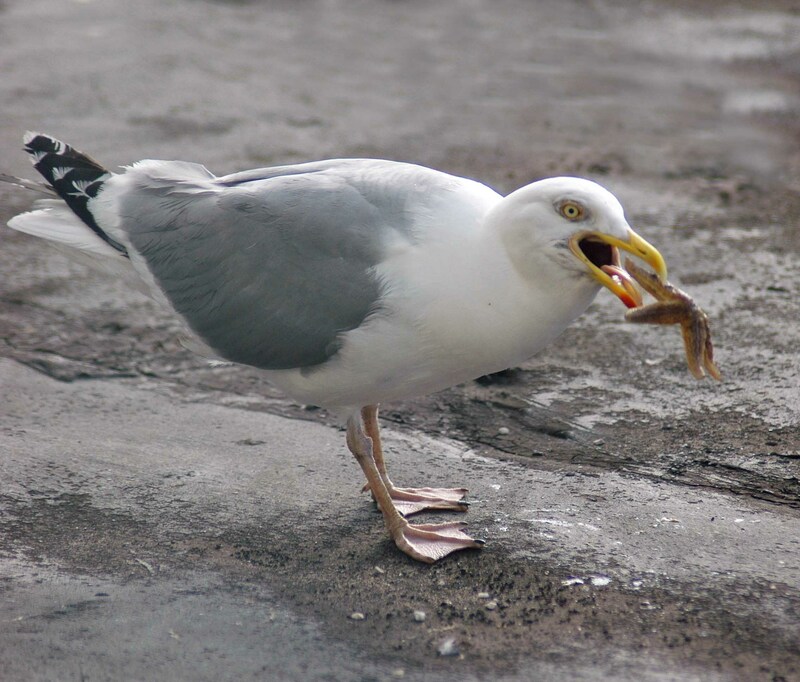 I’m not sure they are very well versed in nutrition though; ever the opportunists I saw them bring forth a variety of foodstuffs, including french fries, raw chicken, bits of crab and a still-wriggling starfish. 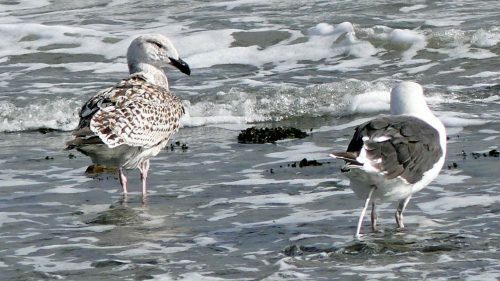 The gulls took time out in the afternoons to rest together, the pair work together to raise their young and appear to be well bonded. 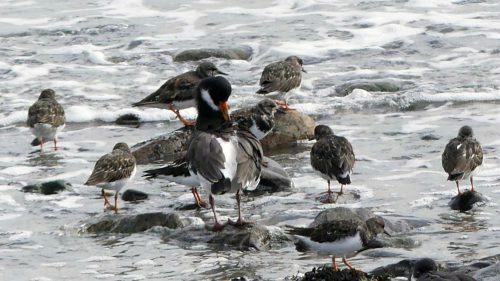 Although they would appear to be relaxed, they were ever-vigilant and well aware of the presence of other birds in their airspace, taking it in turns to issue warnings. Saturday dawned bright, sunny and very cold, but at least it wasn’t windy. 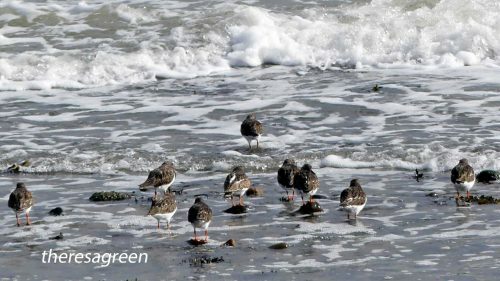 The sunshine encouraged me out to walk and I headed for the beach where I had hoped to take advantage of the clear light and take some shots of the mussel beds that are central to the presence of the wading birds. 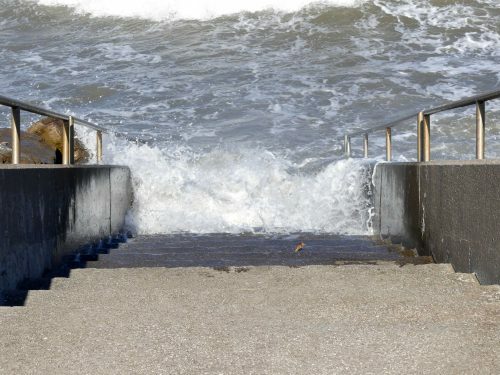 However, when I reached the end of our road I could see the tide was almost fully in, so that put paid to that idea. 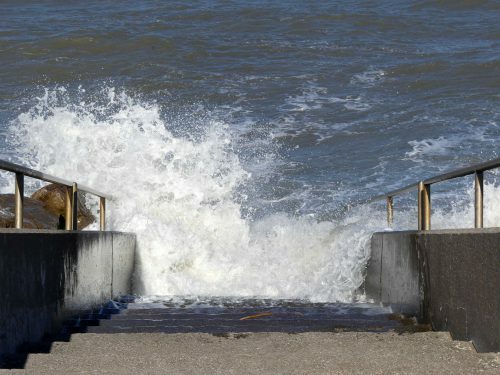 The sea was remarkably calm, but it was penetratingly cold and I almost turned around to go back for the car and drive somewhere more sheltered. 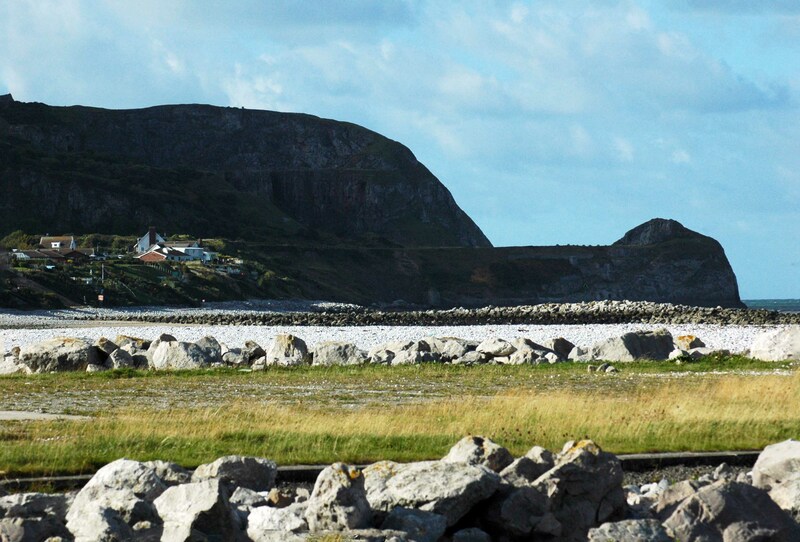 Then I spotted a couple with telescopes peering out to sea and naturally had to find out what they were looking for. 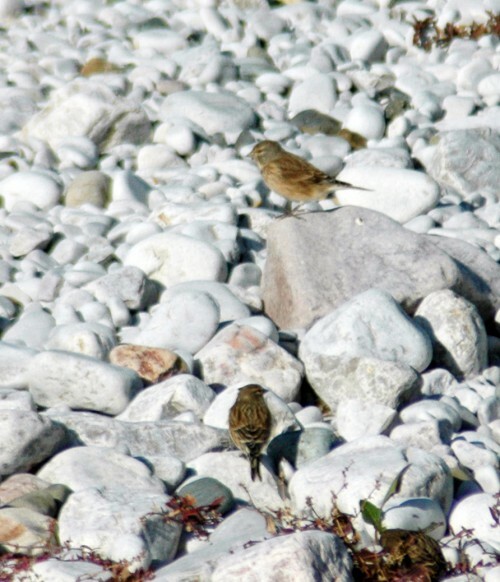 As I approached them I spotted a bird on the rocks, a Rock pipit was foraging along the boulders of the sea-break. 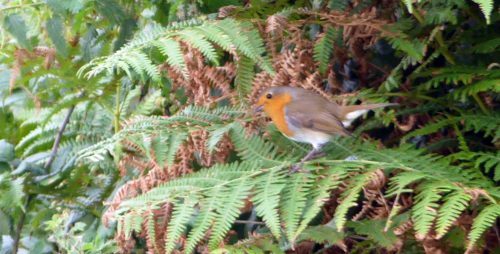 It was a lovely healthy-looking bird and getting around quite nimbly despite the fact that the poor thing had lost most of one of its legs. 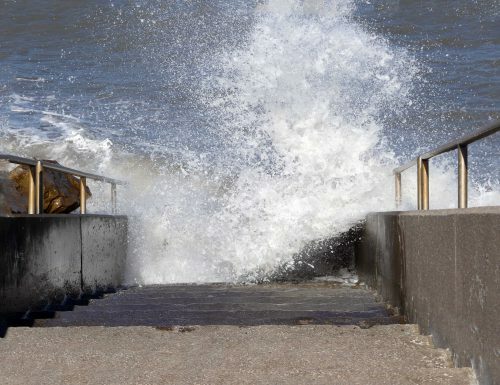 It turned out that the couple with the telescopes were hoping to see divers, although apparently without much luck today. 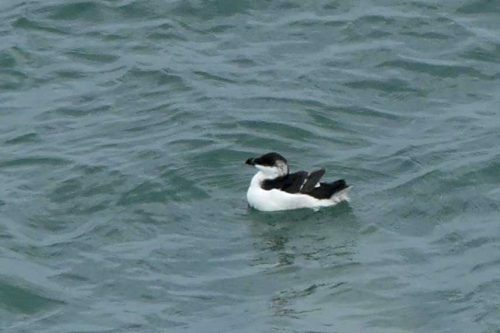 I know many birders enjoy sea-watching and spotting some of the less commonly seen species of sea birds, but as the best sightings are during the colder months and a lot of patience is required to achieve often very distant sightings, it’s not really my cup of tea. 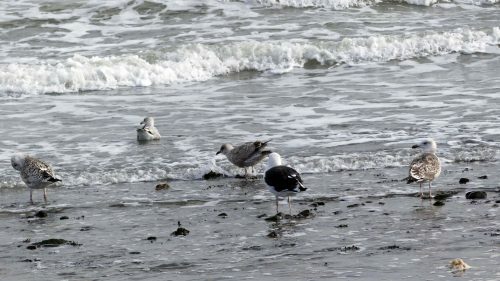 I am interested by the fact that it is possible to sight the birds around this coast though, and did a little research into them in the warmth of the house. 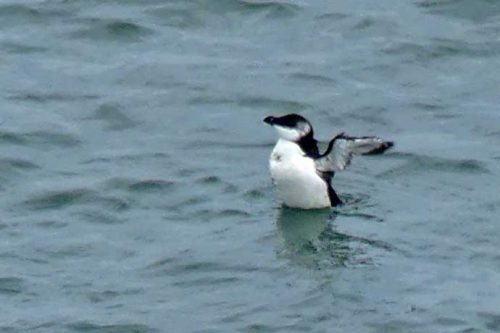 The following information is from the RSPB website and from that I think the Red-throated diver is the species most likely to be seen offshore here. 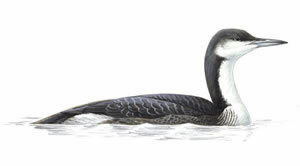 Black-throated Diver (RSPB image)-Found on Scottish Highland lochs in summer and around sheltered coasts in winter, and rarely along Irish Sea coasts. 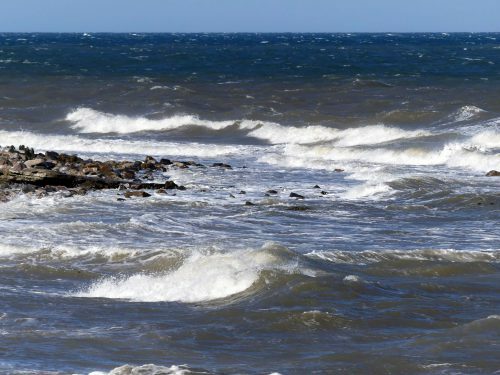 Moray Firth and W coast of Scotland best in winter, as well as the NE and SW coasts of England. 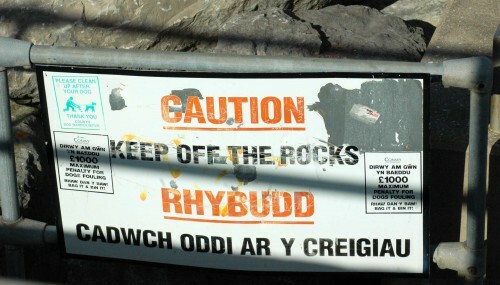 Sometimes seen at inland reservoirs. 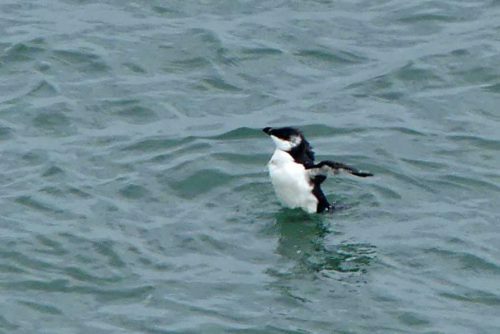 Streamlined diving birds that sit low in the water and dive with consummate ease. 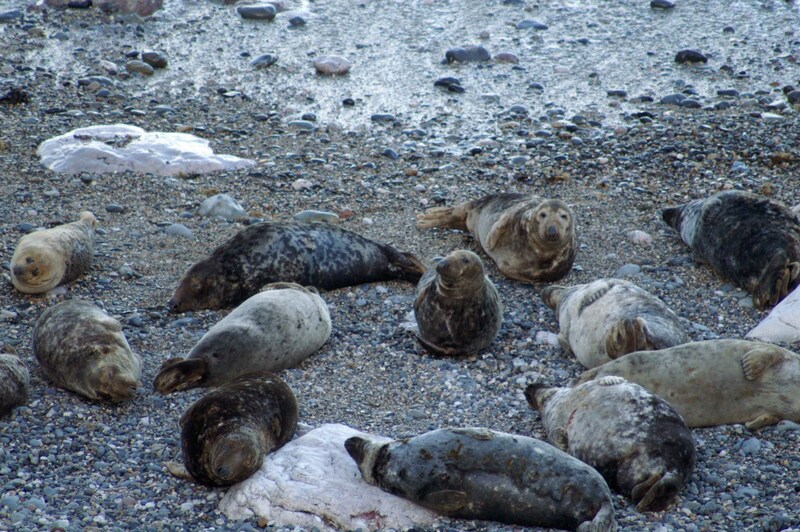 On land they are clumsy, barely able to walk with their legs so far back on their bodies. 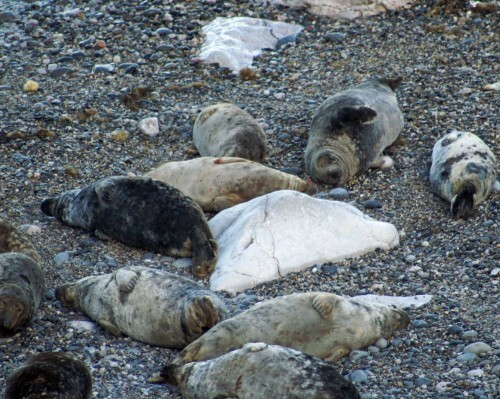 They are easily disturbed when breeding and their vulnerability to marine pollution make them a vulnerable as well as rare breeding species. 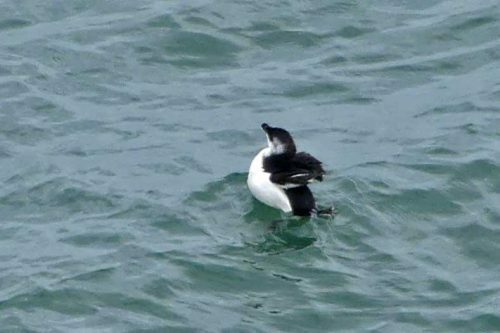 Red-throated Diver- Gavia stellata -Outside the breeding season it is numerous along the UK's east coast, and occurs patchily along the west coast, with concentrations off west Scotland and around north-west Wales. 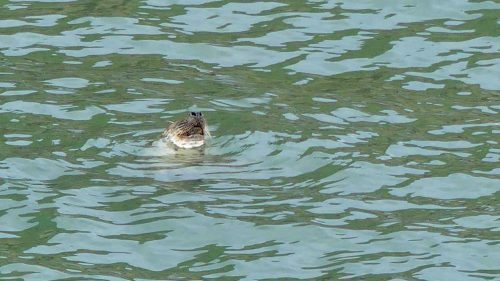 The smallest of the UK’s divers, its grey-brown plumage and up-tilted bill readily distinguish it from the other species. 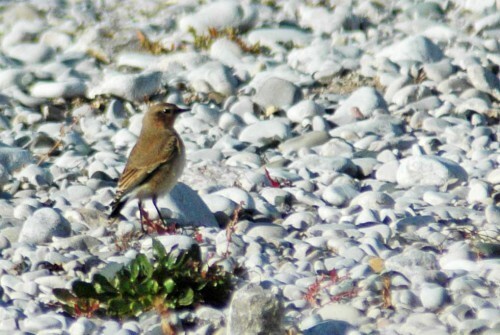 In summer it has a distinctive red throat. They usually jump up to dive and can stay underwater for a minute and a half. 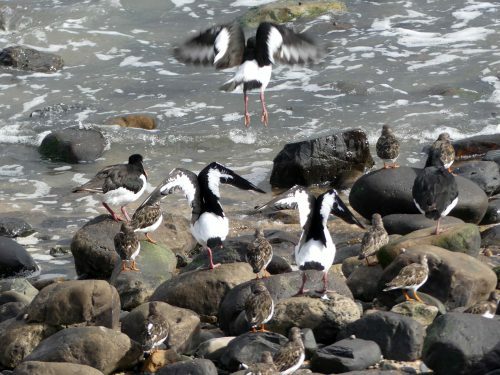 They are very ungainly on land, only coming ashore to breed. 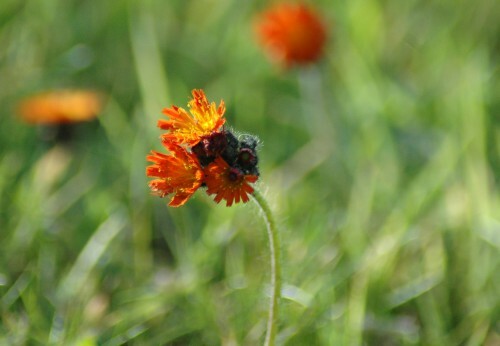 A recent moderate population decline make them an Amber List species. 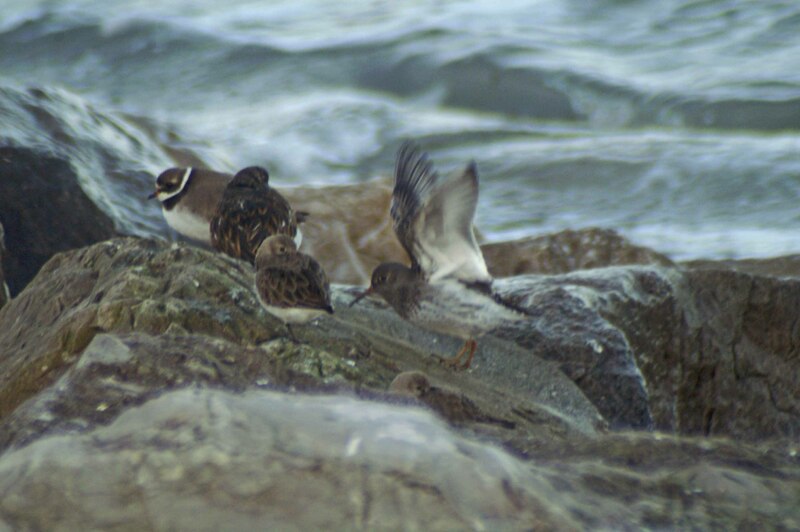 Shetland is the UK stronghold for this species with other key populations on Orkney, the Outer Hebrides and the north Scottish mainland. 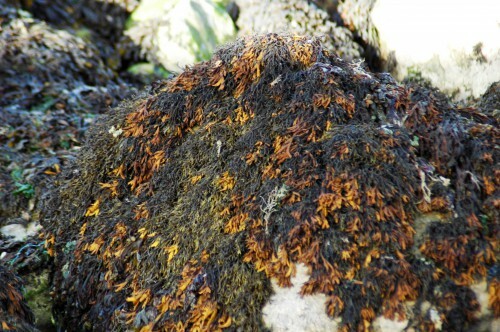 They are also found along the whole of west Scotland south to the Mull of Kintyre. 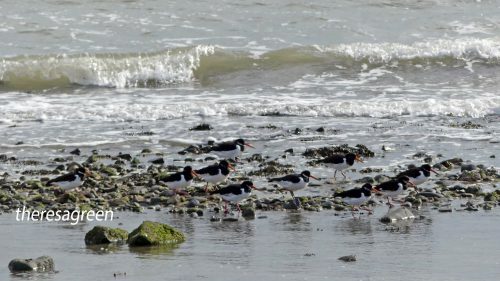 Outside the breeding season it is numerous along the UK’s east coast, and occurs patchily along the west coast, with concentrations off west Scotland and around north-west Wales. 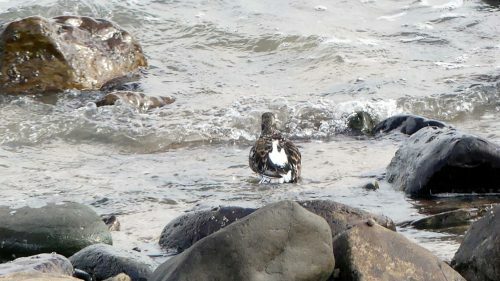 The sea-watching couple had seen a couple of guillemots out at sea and also mentioned a Purple Sandpiper they had spotted on the breakwater rocks, which piqued my interest and sent me off my own ‘twitch’. 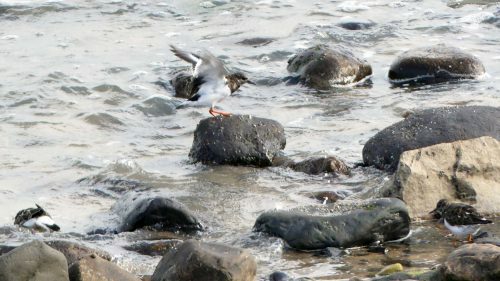 I walked along the promenade, scouring the rocks in the hope of catching sight of the little Sandpiper, but with no luck. 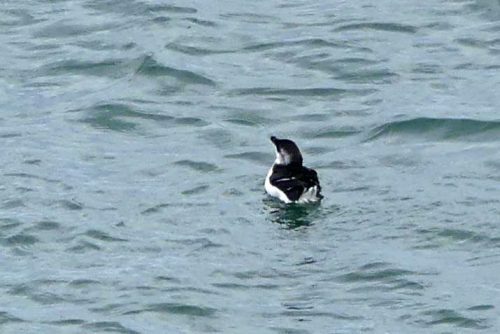 I also paid more attention to the sea and got out my binoculars for a closer look at a distant bird swimming around on the surface. 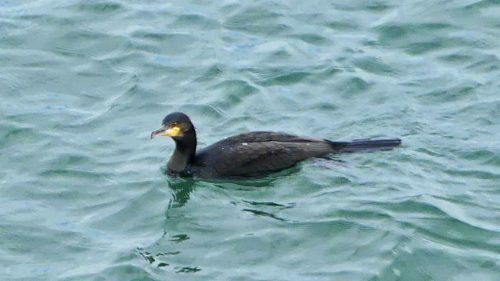 Cormorant-like, but smaller, with yellow patches at the base of its bill and around the eyes and with a distinctive raised crest on its head, it was a Shag – Phalocrocorax aristotelis. 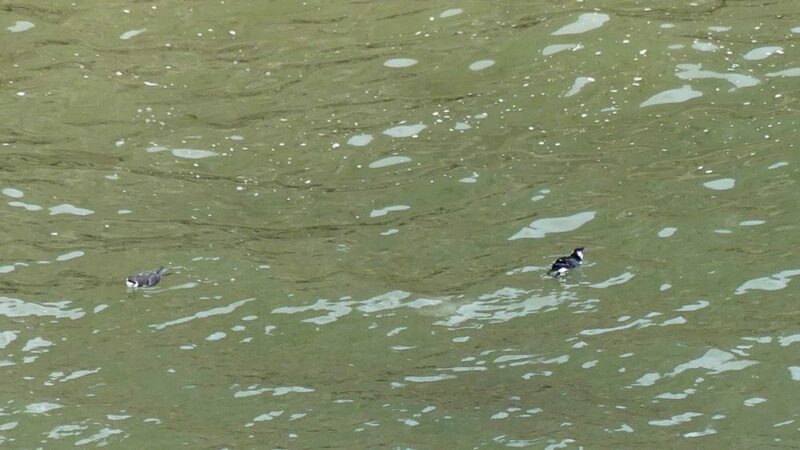 Walking back, another swimming bird, closer to shore this time definitely was neither a cormorant nor a shag. 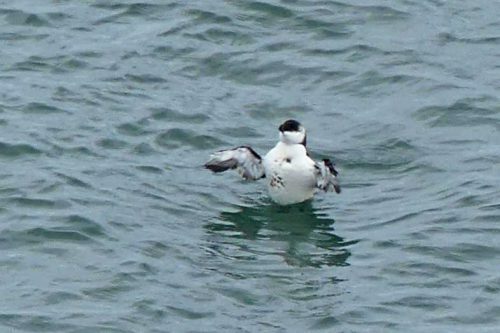 I had no picture in my head then of what a diver looked like, but this was behaving like one, diving frequently and staying under the water for a good while before popping up again. 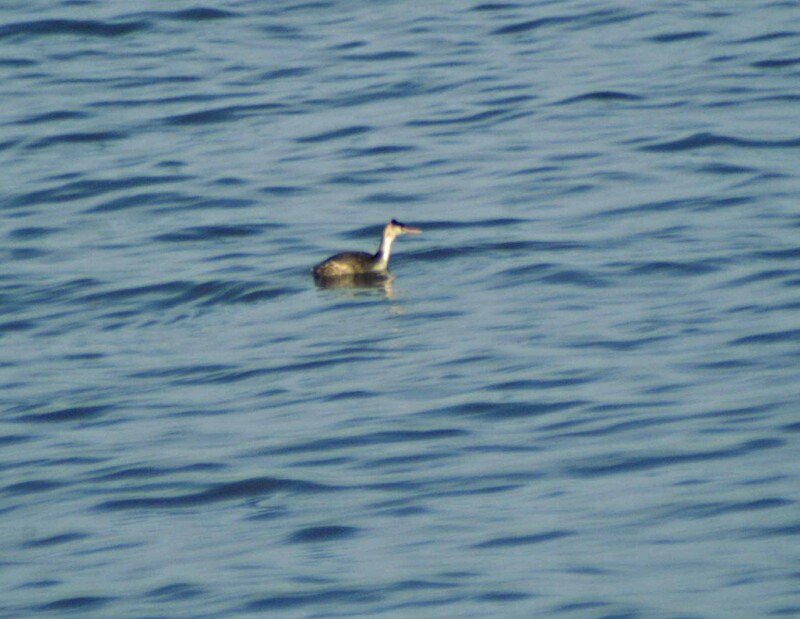 It occurred to me that it was a Great crested Grebe, although I’d never seen one at sea before. 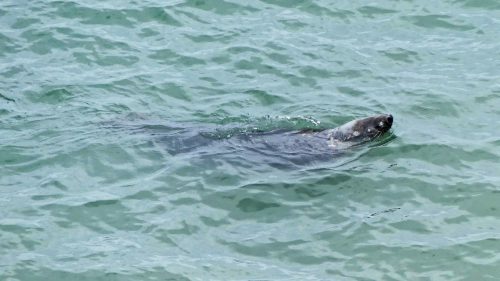 It was a delight to watch, swimming around at some speed then diving elegantly. 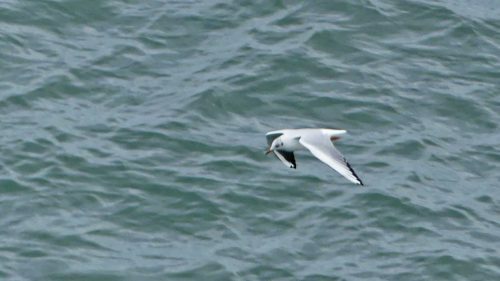 Once it came up almost directly beneath a floating black-headed gull, that was most put out and then just seconds later it dived again and came up with a sizeable fish. It was too cold to stand around for long and my fingers on the camera controls were numb, so I walked back home via the shelter of the neighbouring streets. 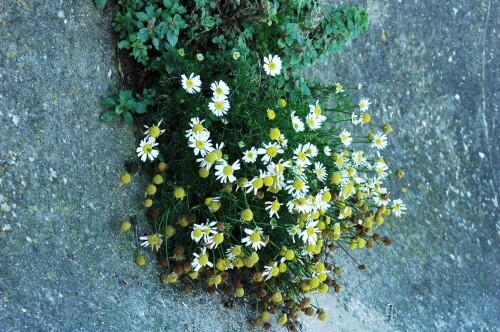 It’s been a while since I walked that way and I was very surprised by the amount of flowers in bloom in the front gardens. 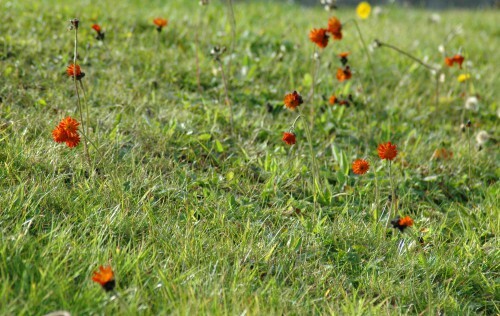 There are already snowdrops, crocus, grape hyacinth, the occasional daffodil and most surprisingly, wallflowers. 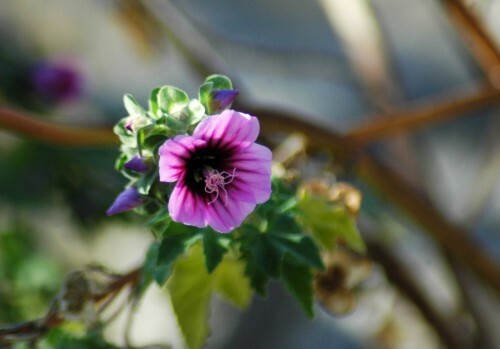 The weather forecast for next week is not good – overnight frosts, sleet and below-freezing temperatures are not so good for too-early flowers. An hour in the house with a cup of tea and a sandwich and I’d warmed up enough to venture out again. 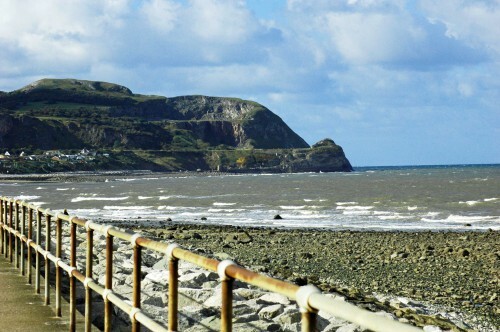 This time I took the car as I was intending to drive over to the RSPB reserve on the Conwy estuary. 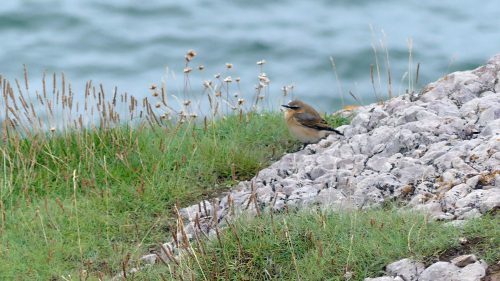 (Point of interest: this morning’s sea-watchers had also told me that a firecrest had been ‘twitched’ there earlier in the day.) 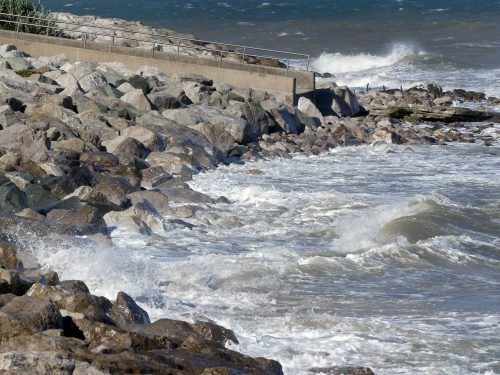 That was not why I was going there, but anyhow as I approached Rhos village I thought I’d pull over and have a quick look around the harbour beach for the Purple Sandpiper. 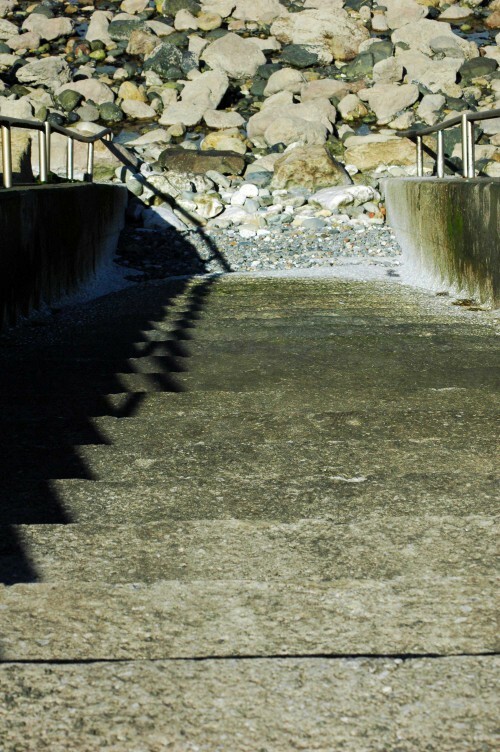 The winter sunshine had drawn a lot of others out to walk too and I parked in the first available space and took the steps down to the promenade. 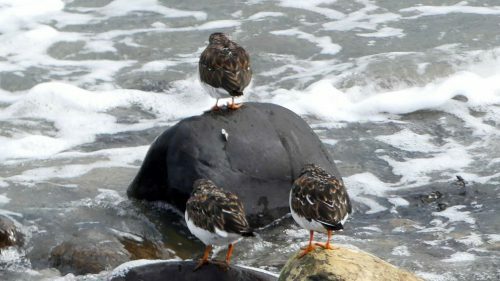 There, almost right in front of me were a group of small birds peacefully dozing on the rocks waiting for the tide to turn. 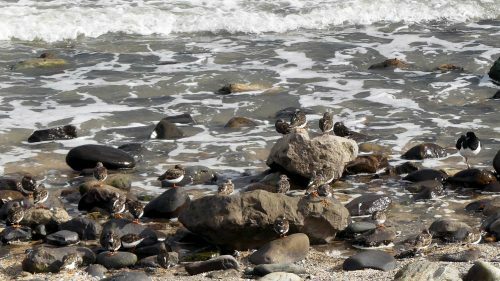 I recognised the turnstones and ringed plovers immediately, but was not so sure of the identification of the members of the majority of the group. 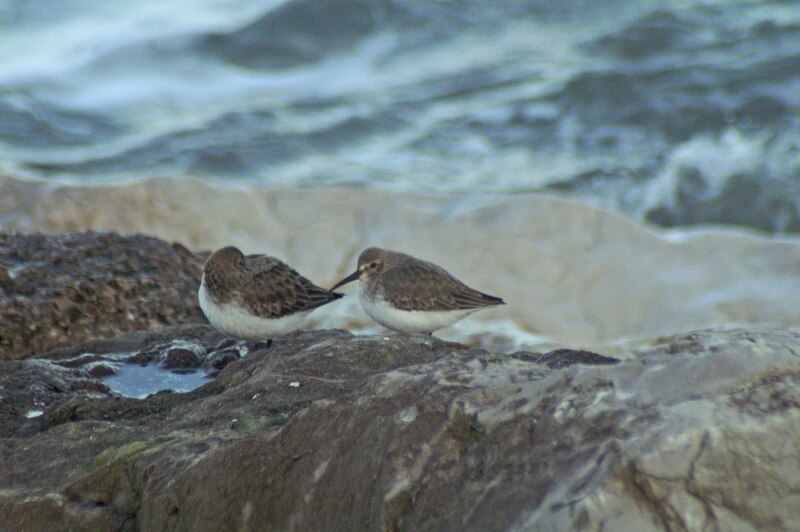 I had to wait for one to stand up and show itself properly to be fairly sure they were dunlin – it was the long bill, slightly decurved at the end that clinched it. 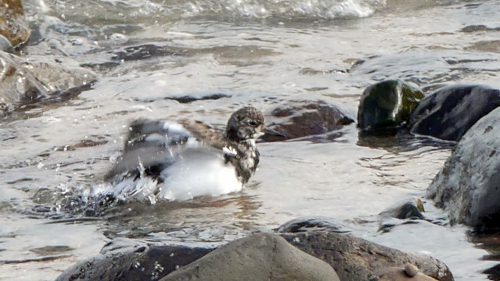 I was more than happy to those three species together, but things got even better when I realised there were a small number of purple sandpipers tucked in there as well ; fortunately they are much more distinctive and I recognised them with no problem. 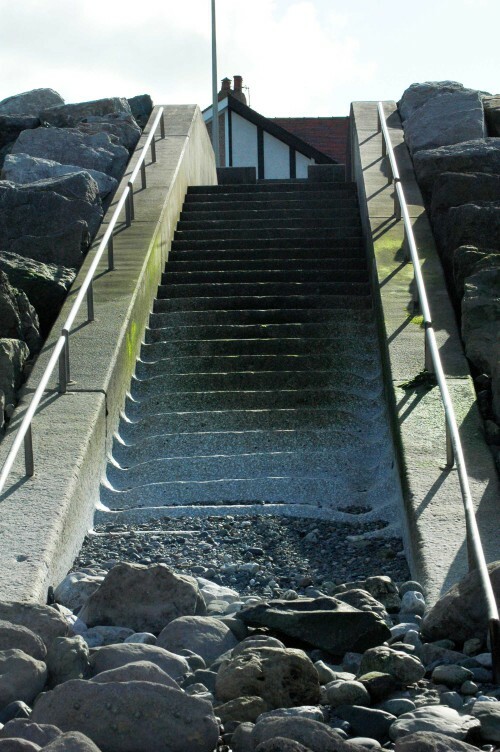 I saw 3 in total, but there could have been more tucked down lower on the rocks. 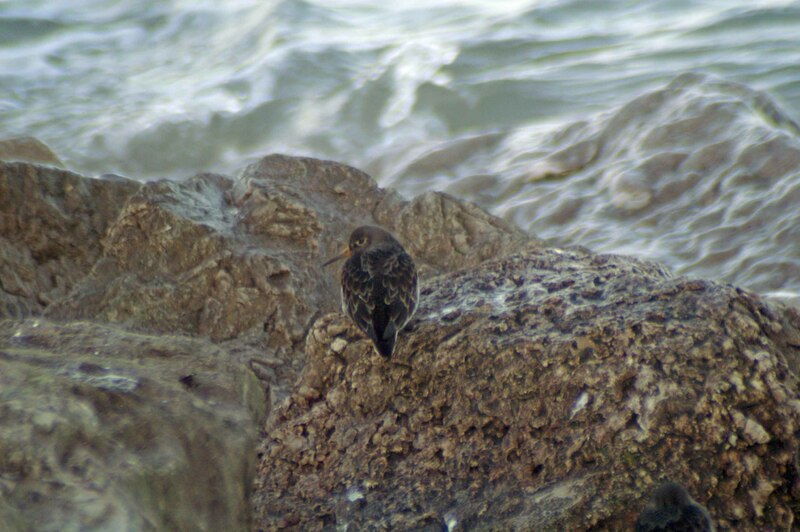 The Purple Sandpiper is usually a strictly coastal wader that visits Britain in the non-breeding season and then flies north to breed during the summer. 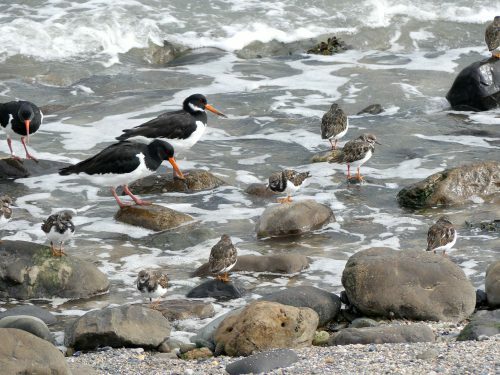 They are seldom found on sandy beaches but prefer rocky coasts, where they can be seen searching for molluscs and crustaceans among the rocks and rock pools. 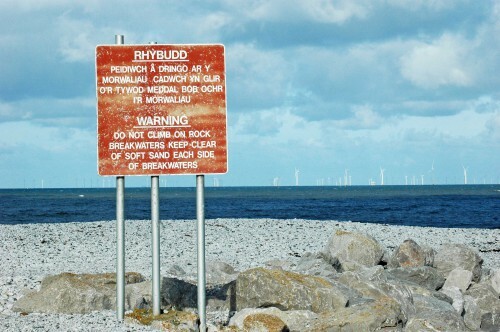 In the North West They can turn up on any rocky coast from the tip of the Llyn peninsular in North Wales to Morecambe bay in the North. 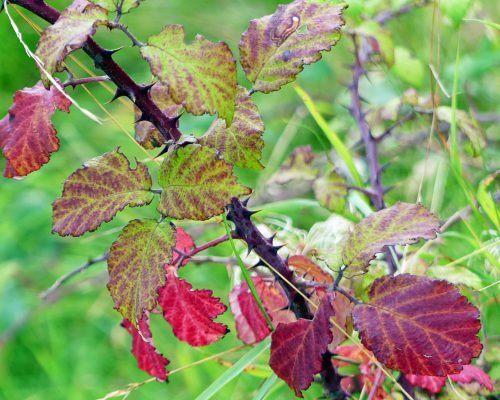 They begin to arrive in October, reaching a peak by November and start to leave again in April. 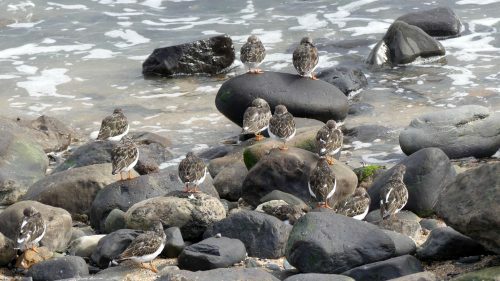 By June, at the latest, they are gone.They are about the same size as a turnstone, with whom they are often seen, and a dark bird overall. 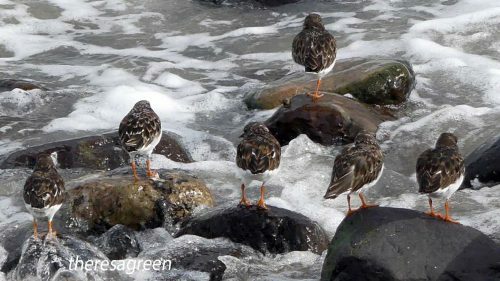 The purple sandpiper is the only small dark wader with yellow/orange legs likely to be seen on rocky shores,frequently in association with turnstones. 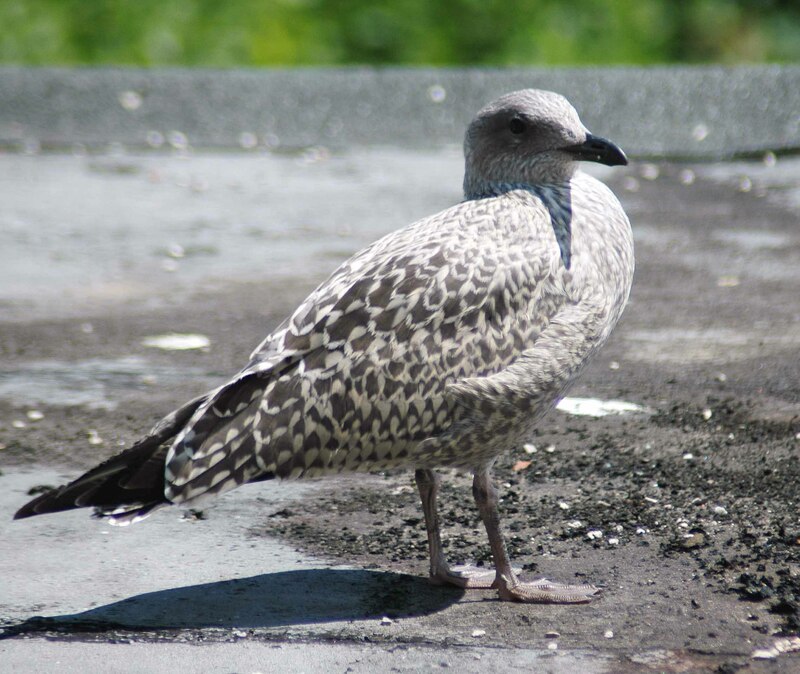 They have a rather round-shouldered appearance, the wings are very dark grey, the head and back a slightly paler shade and the partially streaked breast an even paler shade. 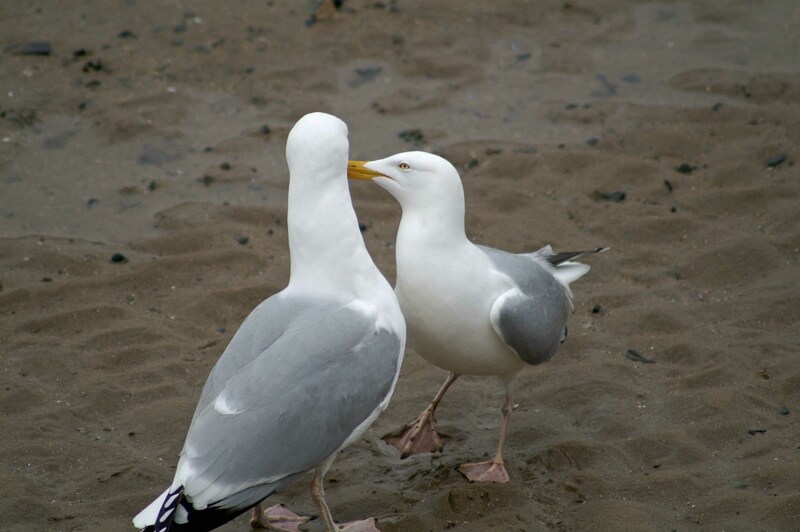 They have a longish beak for their size which is dark grey/black with a yellow or orange base. 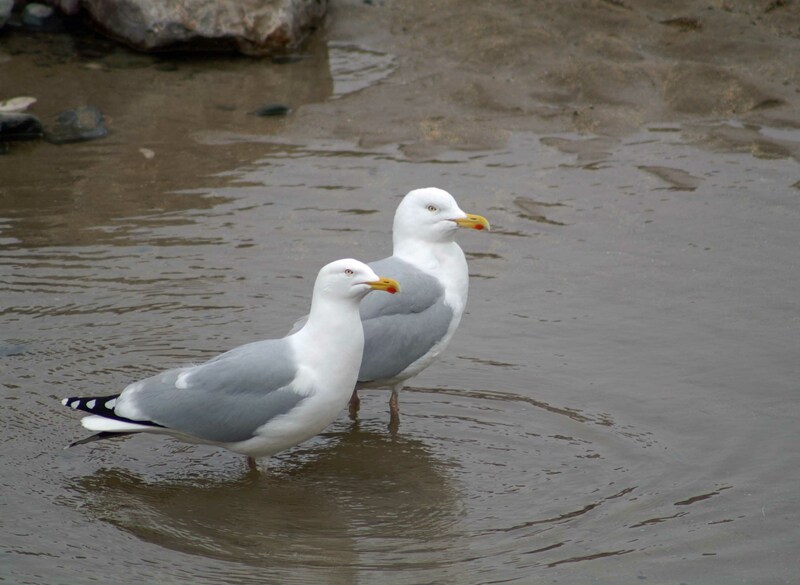 Their legs appear fairly substantial and are bright yellow or pale orange. 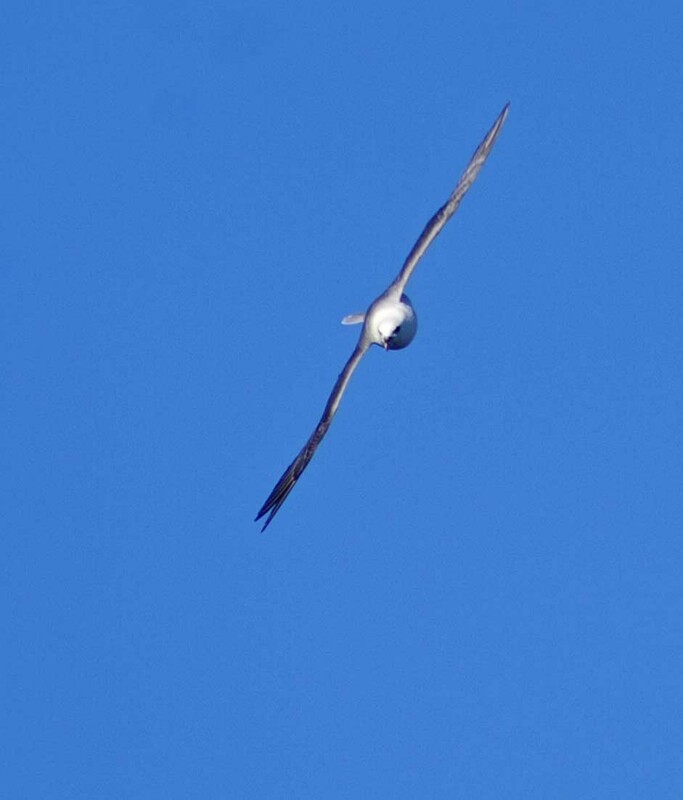 In flight they appear very dark with just a faint, narrow white wing-bar and bold white edges on a black/dark grey tail. 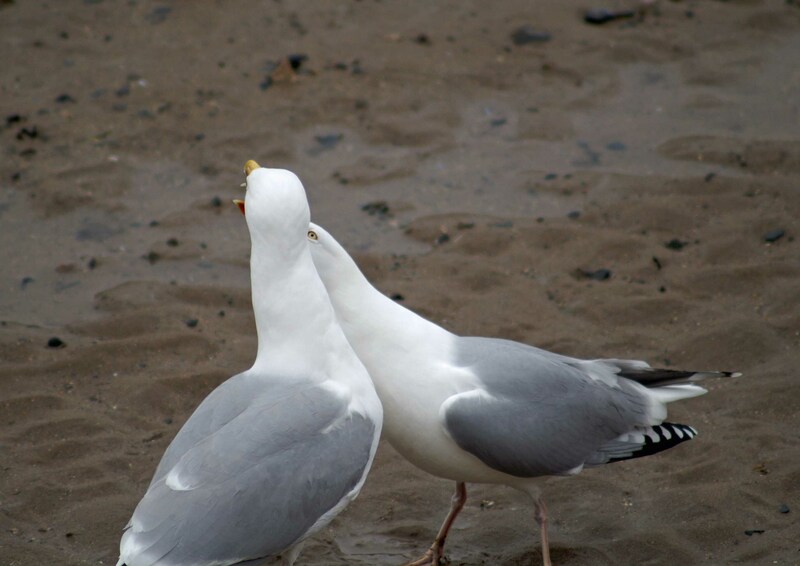 The birds were so close to the promenade that quite a few people passing by noticed them; some of whom stopped and asked me to identify the species for them. 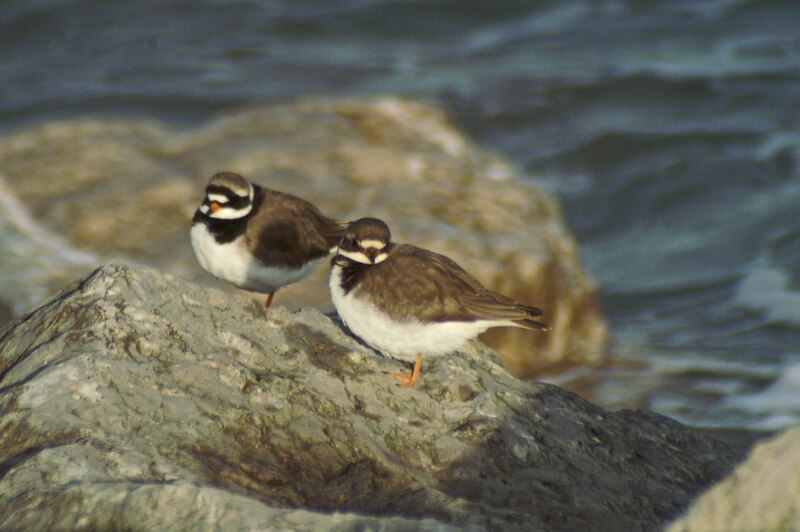 Perhaps not too surprisingly, it was the attractive Ringed Plovers that aroused the most amount of interest. 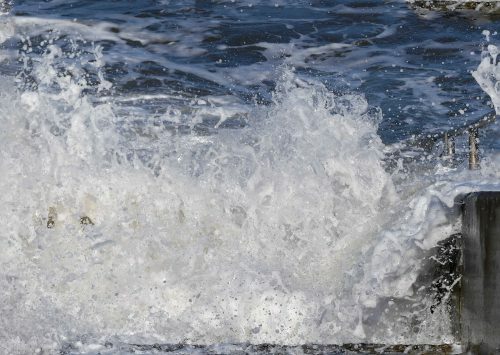 Cormorants are breeding residents here and since I arrived in July sightings of the birds flying or swimming in the sea have been consistently frequent, but in recent weeks their numbers have increased manyfold. 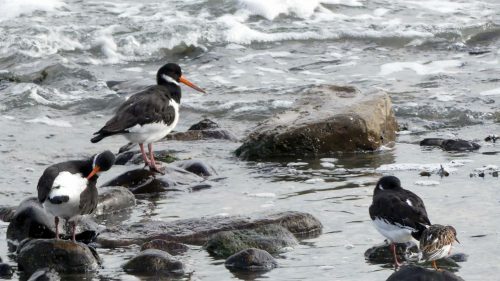 Numbers of them now joined the ranks of oystercatchers and gulls that line the sea-edge as the tide comes in, and they can be spotted on the rocks of the harbour breakwater and perched on top of available posts. 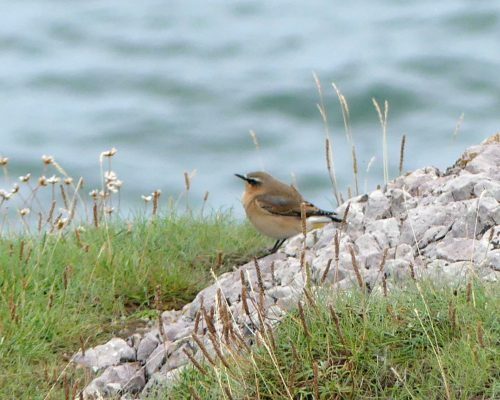 There are almost always a few to be seen on the lower reaches of the Little Orme, but now there are many, their black forms punctuating the pale limestone. (n.) A voracious eater; a glutton, or gluttonous servant. 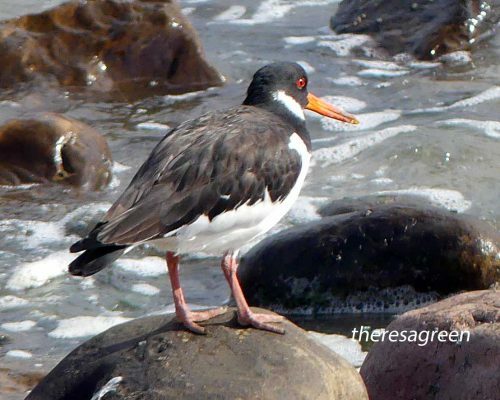 (n.) Any species of Phalacrocorax, a genus of sea birds having a sac under the beak. 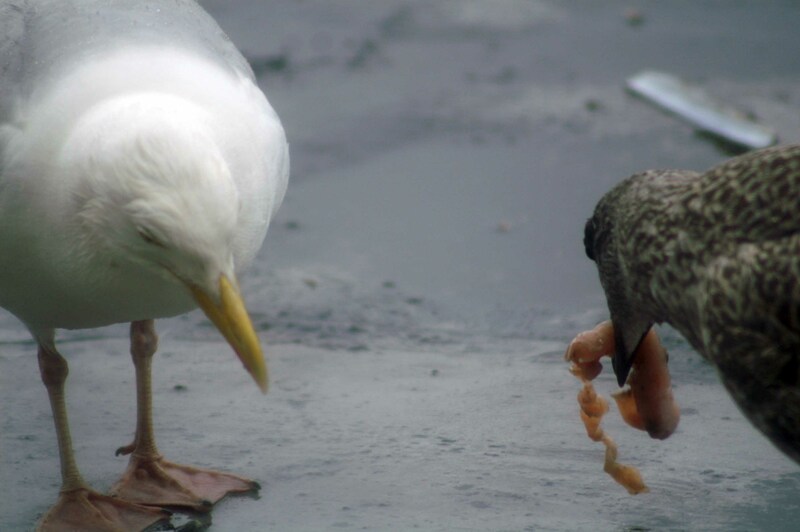 Cormorants devour fish voraciously, and have become the emblem of gluttony. 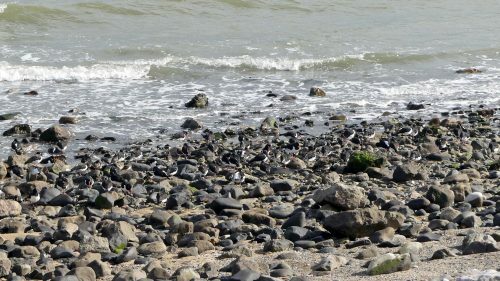 They are generally black, and hence are also called sea ravens, and coalgeese. 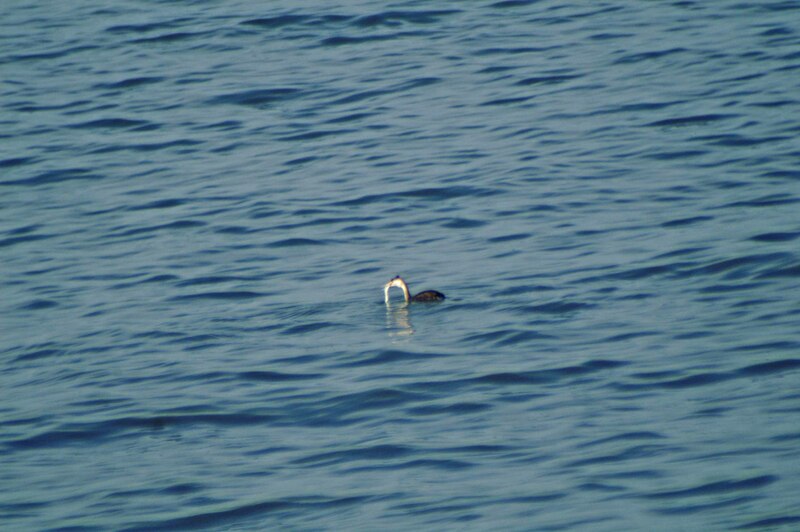 A large and conspicuous waterbird, the cormorant has an almost primitive look about it.Its long neck makes it appear almost reptilian, particularly when swimming with the bulk of its body submerged. 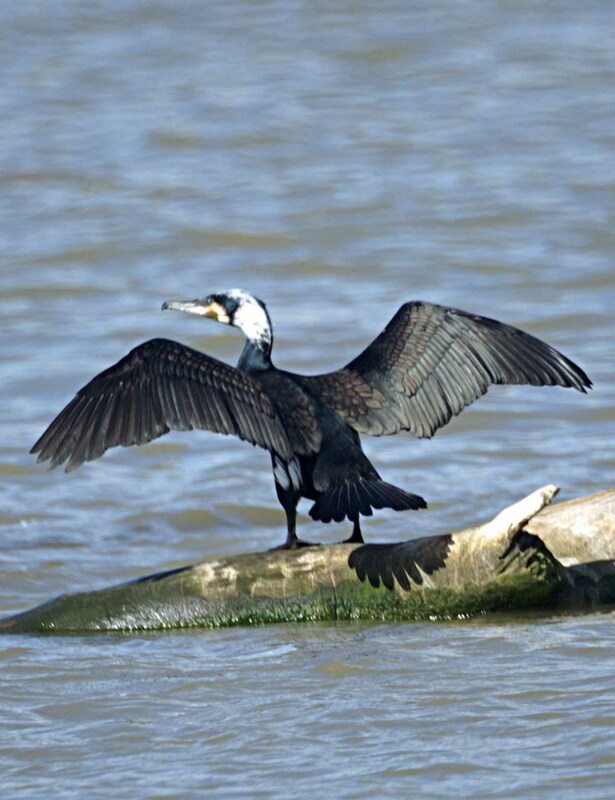 Cormorants are coastal rather than oceanic birds, and many have colonised inland waters – in fact the original ancestor of cormorants seems to have been a fresh-water bird, judging from the habitat of the most ancient lineage. They range around the world, except for the central Pacific islands. 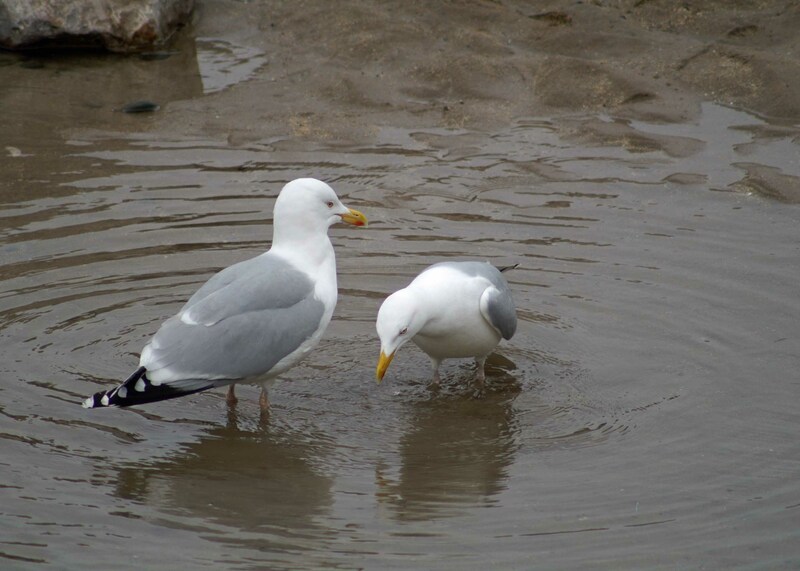 All are fish-eaters, feeding mainly on small eels and flat fish. 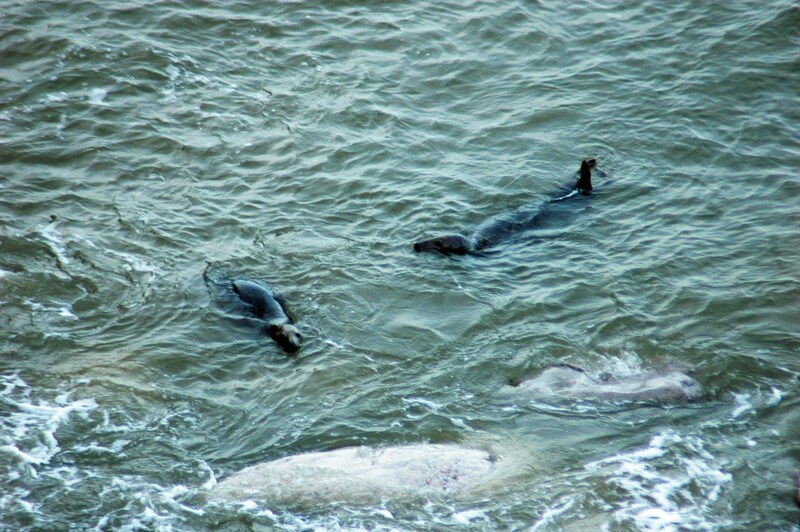 They dive from the surface of the water. 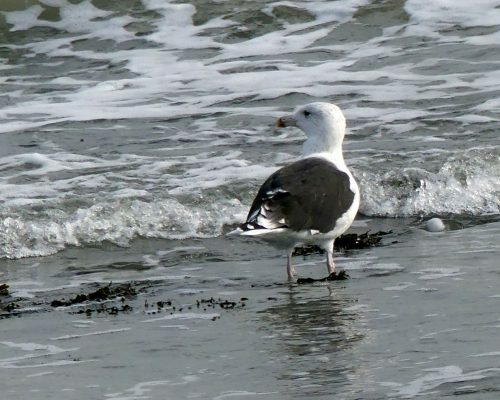 All four toes on each foot are webbed which aids them in swimming and in pursuing fish underwater. Cormorants are supreme fishers which can bring them into conflict with anglers and they have been persecuted in the past, although some enterprising Japanese and Chinese fishermen employ the bird’s expertise to assist them, training one species of the birds to dive and catch fish for them. 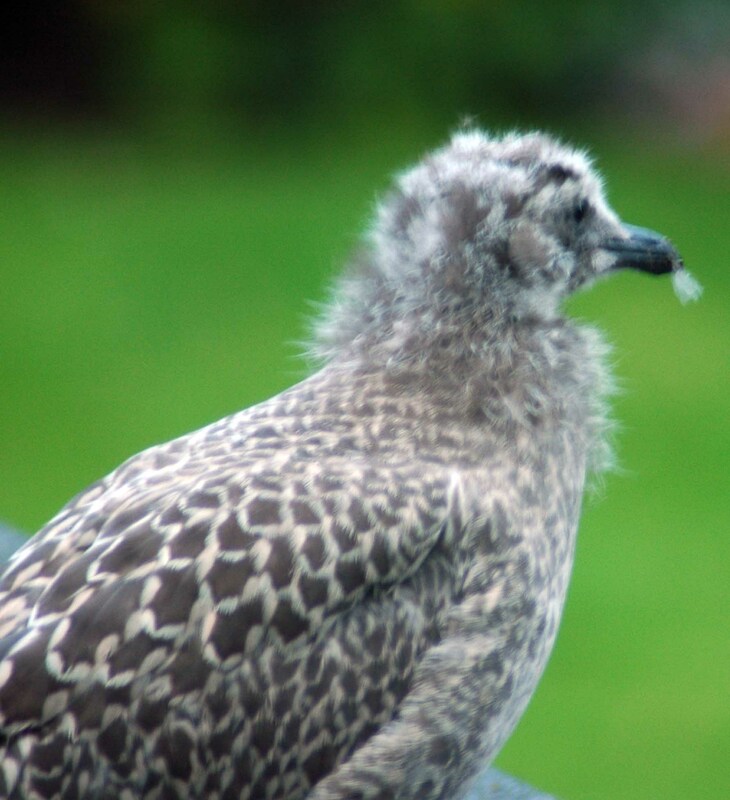 A juvenile Cormorant with partial paler underparts still present. Male Cormorant in his full breeding plumage, wings outstretched. 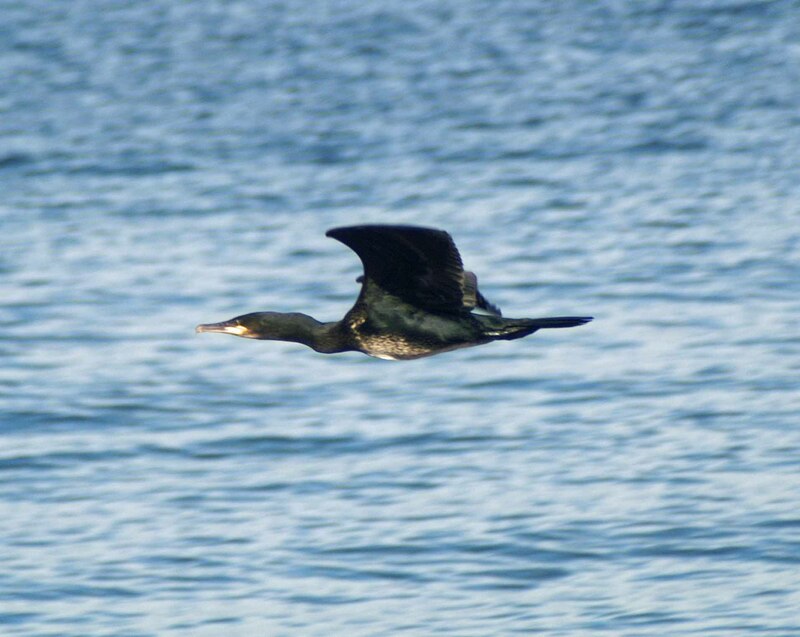 This is one of my favourite Cormorant photographs, I took it in Sotogrande, Spain earlier this year (Feb). 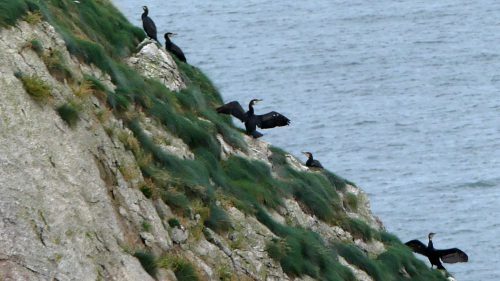 Click on the link for more photographs of Cormorants in Spain on my blog ‘Nightingale Trails’. 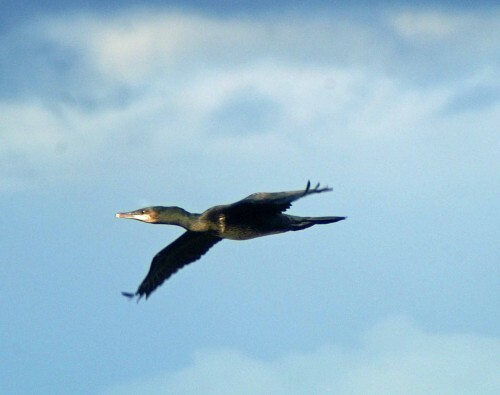 Cormorants feature quite commonly in heraldry and medieval ornamentation, usually in their “wing-drying” pose, which was seen as representing the Christian cross. For example, the Norwegian municipalities of Røst, Loppa and Skjervøyhave cormorants in their coat-of-arms. The species depicted in heraldry is most likely to be the Great Cormorant, the most familiar species in Europe. 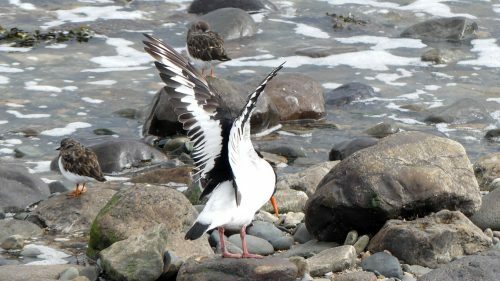 In 1853, a woman wearing a dress made of cormorant feathers was found on San Nicolas Island, off the southern coast of California. She had sewn the feather dress together using whale sinews. She is known as the Lone Woman of San Nicolas and was later baptized “Juana Maria” (her original name is lost). 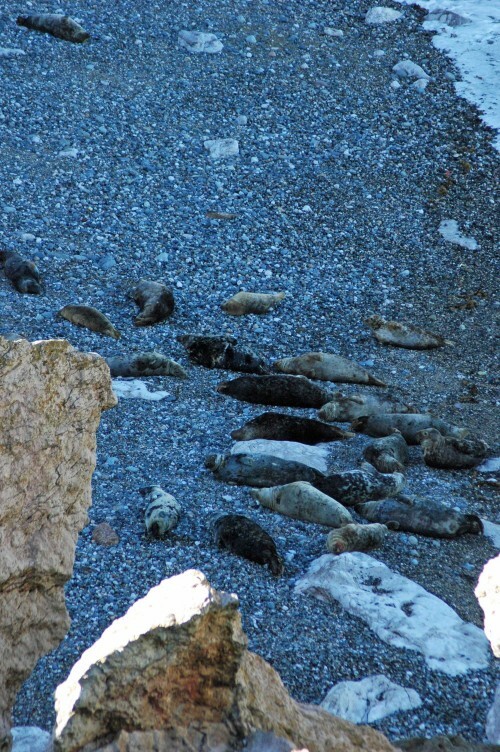 The woman had lived alone on the island for 18 years before being rescued. 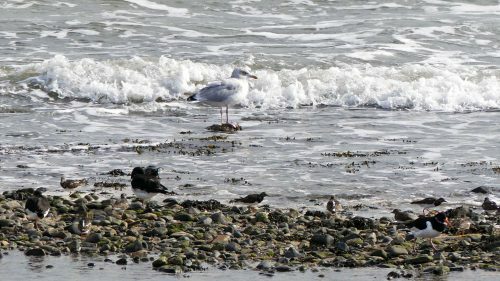 The bird has inspired numerous writers, including Amy Clampitt, who wrote a poem called “The Cormorant in its Element”. The cormorant was the disguise used by Satan in Milton’s Paradise Lost. The cormorant was significant as a symbol of “true Life/ Thereby regain’d,” and was ironically used by Satan. Satan sat on top of the Tree of Life as a cormorant in his first attempt to deceive and tempt Eve. 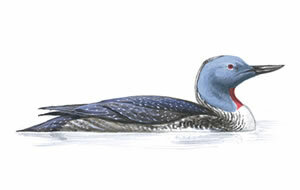 There is a cormorant portrayed in the first of the fictional paintings by Jane Eyre in Charlotte Bronte’s novel, representing Blanche Ingram. 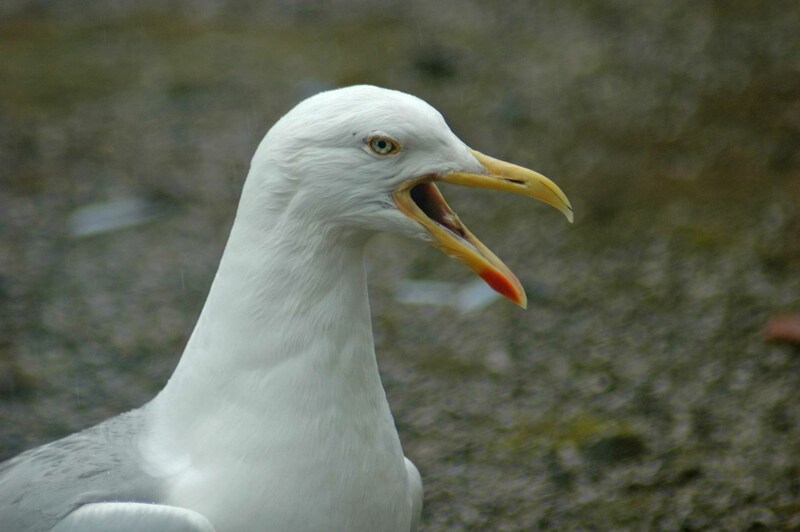 The mythical ‘Liver Bird’ symbol of Liverpool is commonly thought to be a cross between an eagle and a cormorant.